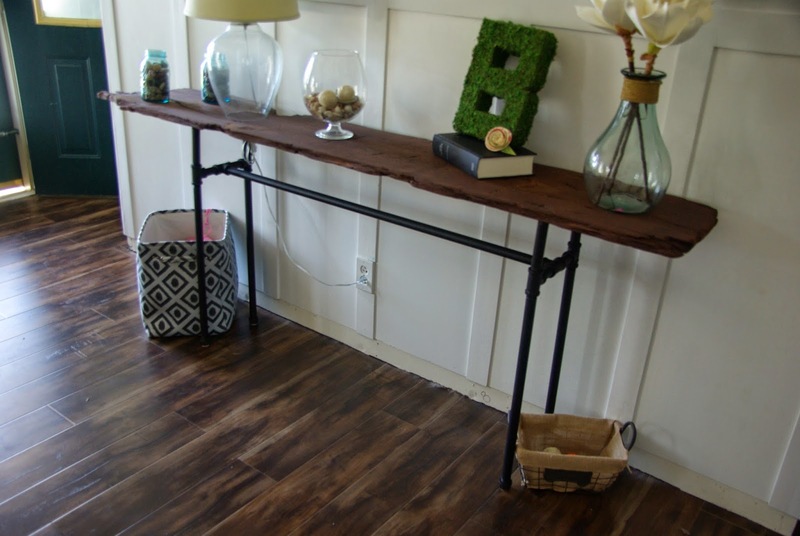 I am so excited to share this DIY industrial/rustic console table we just finished. I am talking the table just got moved in from the garage. But it is amazing, turned out wonderful and I want to share it all with you. I rearranged our loving room a while ago. 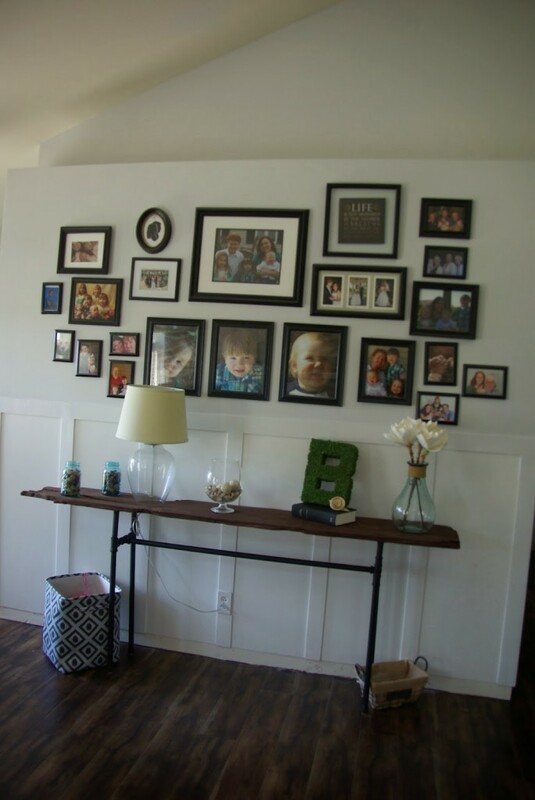 I have a blank area in my living room, under my family gallery wall. I now use the table that was in this spot as my desk in the office/study. So for a while it was a bare space. I am not the type that has to decorate every corner and inch of my home. Some empty spaces can be calming and welcome. 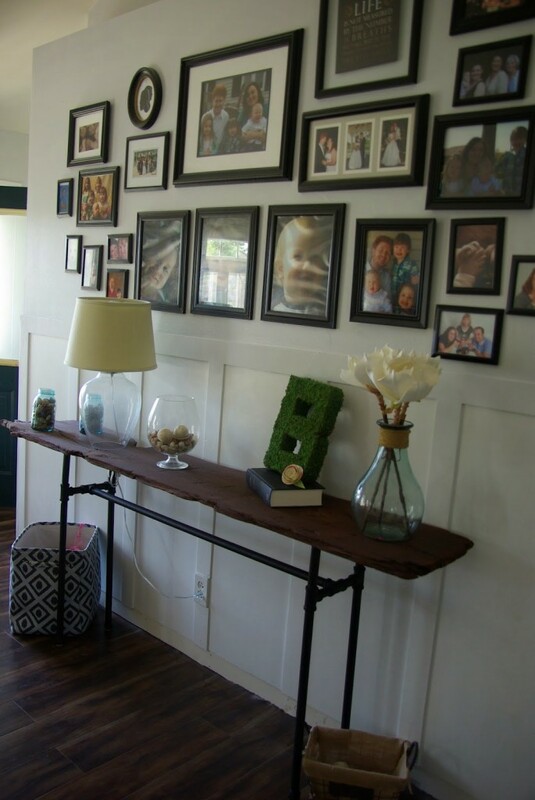 But this spot screamed console table. I had a few I fell in love with online. But they were well over $700. More then I was willing to spend. And when my husband saw what I was leaning to splurge on he went all cave man on me. “I can build that, we are not giving someone else our money for something that is so simple.” Well then Mister Handyman. Do you. So he did, he explained how it could be done. I saw the light and possibilities. 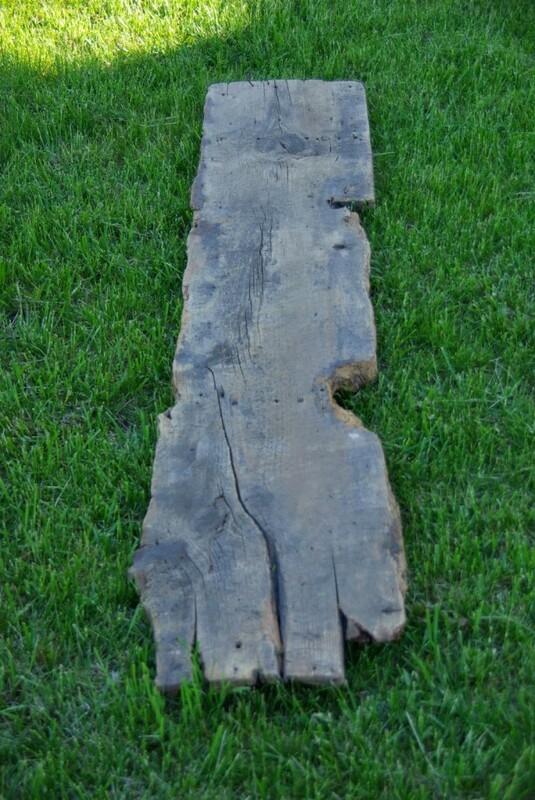 We found a old piece of wood at a lovely place called serendipity farm. We visited it and I wrote about my experience there. I am not sure what type of wood it is. 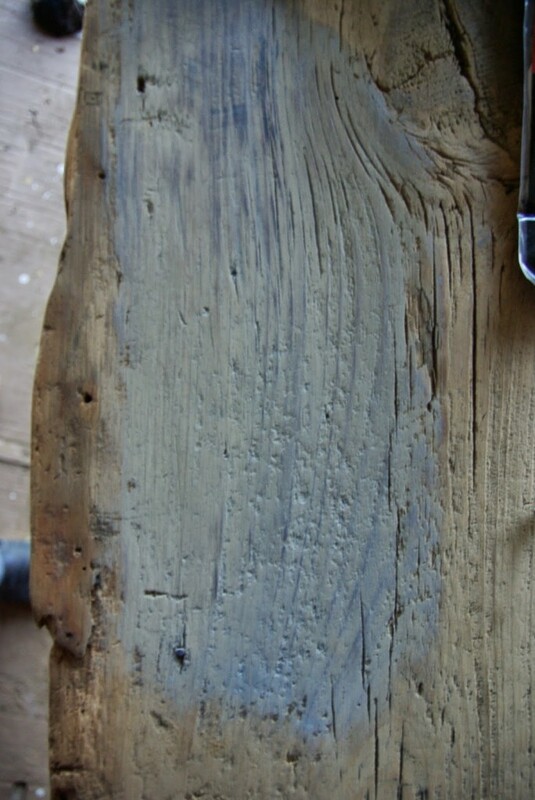 There is a lot of knots, and other lovely distressed features. I know it seems a little crazy. I mean on the scale of 1-10 on rustic this is about a 12. 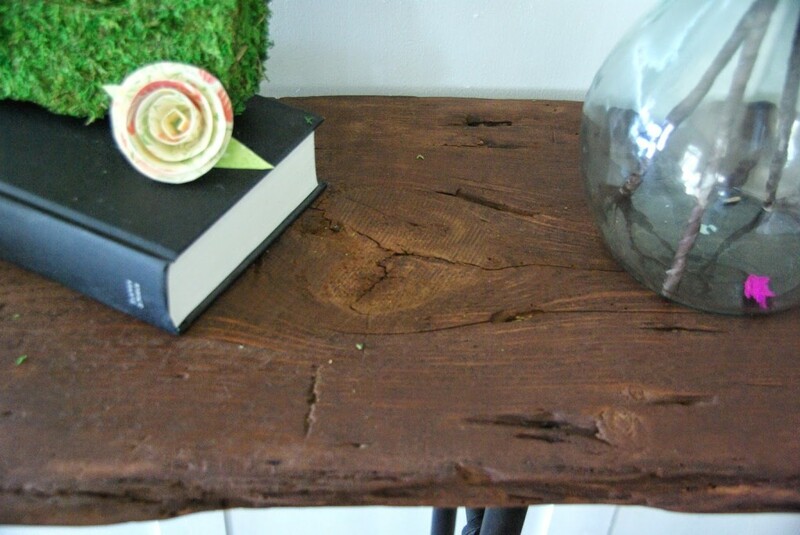 But I saw the potential and was so excited we found the first piece needed to make my console table dreams a reality. The board itself is just shy of 7 feet. I was planning on cutting a few feet off. The width is a little over 1 foot, and 1 inch thick. 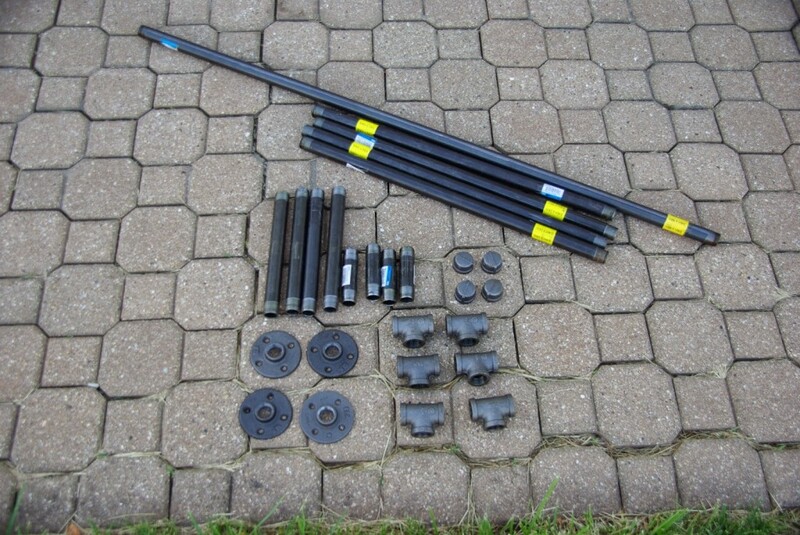 Next we purchased a ton of galvanized pipes. I wrote down the main detailing I wanted to the table. A rough plan was put into place. Where I wanted the pipes to be. We measured roughly the length and height I wanted and went to work piecing it all together in the store. I wanted to make sure it all fit properly. I mean we did not build the whole table. But did set the pieces out in a mock version of the table. I did not want to get home and realize that there was a large portion of the table missing. I wanted these to all be black. They were black-ish. Some portions of the pipes appeared more silver. 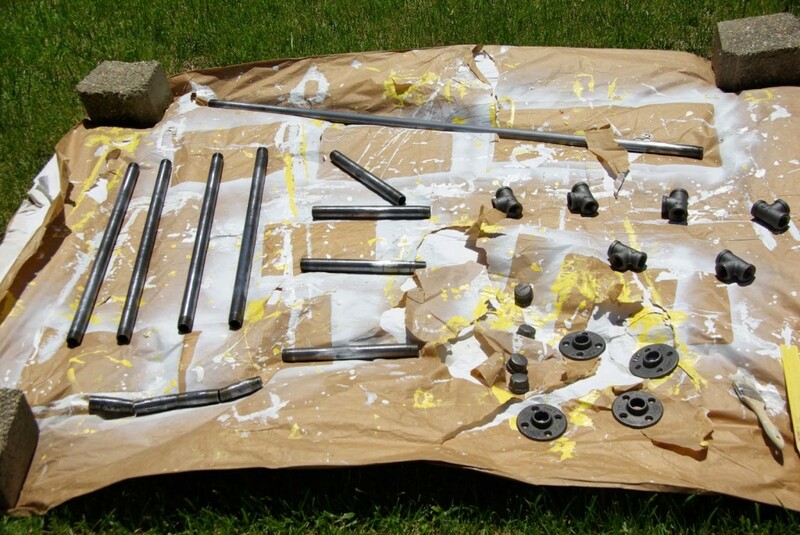 So I purchased some trusty Rust Oleum black spray paint. I had to sand down the pipes a little. 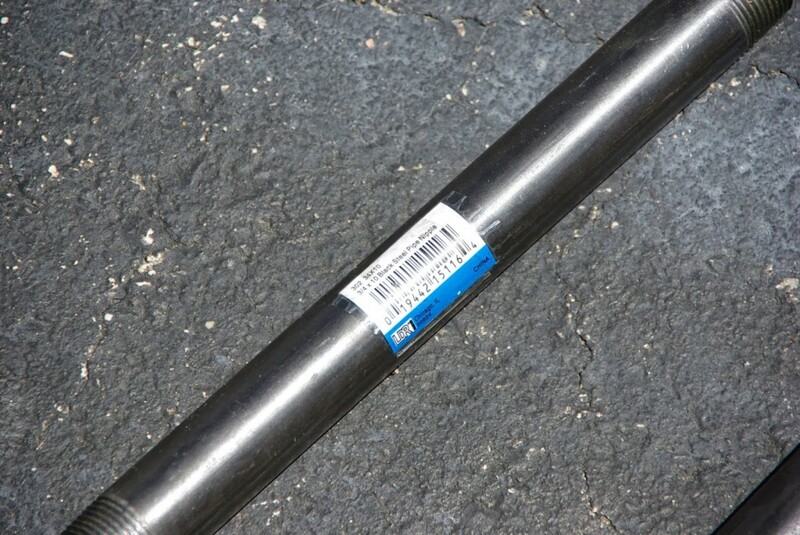 There was these annoyingly little adhesive stickers on each of the pipes. Once off they left a sticky mess on the pipe. So sanding it is. I know that this is the case with most DIY things. But I HATE SANDING! I think it has to do with the fact that I see no results, just all of the steps I have not gotten to take yet in my plan to finish the project. Just sanding. But I got through it. And when I say I got through it I mean Dale. He sanded this all up. I did bring him cold water. all roughed up and ready for some real progress, paint! I also took each sanded piece from him and spray painted it black. I did one coat, turned them over and painted that side. Once there was one full coat all around I sprayed it again just to make sure there was no missing spots. 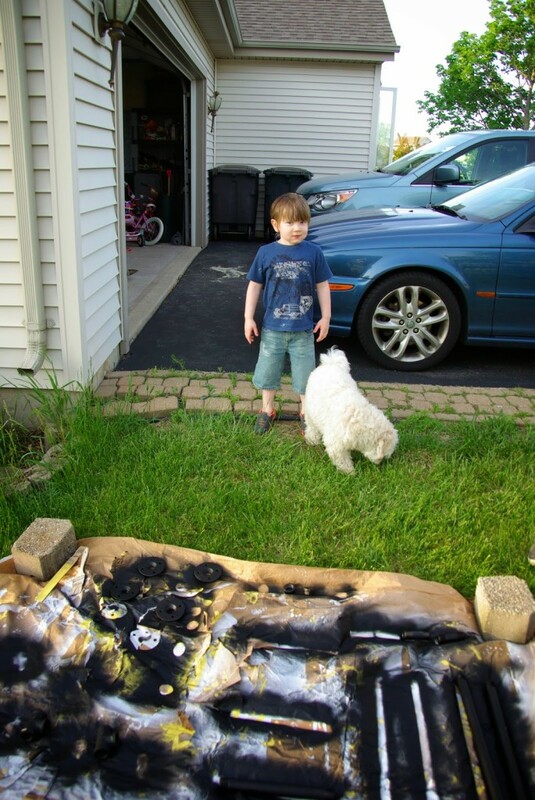 do not EVER spray paint on something you plan to reuse, other then to spray paint some more. This is the mess that was left on our paper. We also really cant use it for anything now other then to paint black because it does still leave a nice black stain on whatever sits on it. Beware! Next staining. 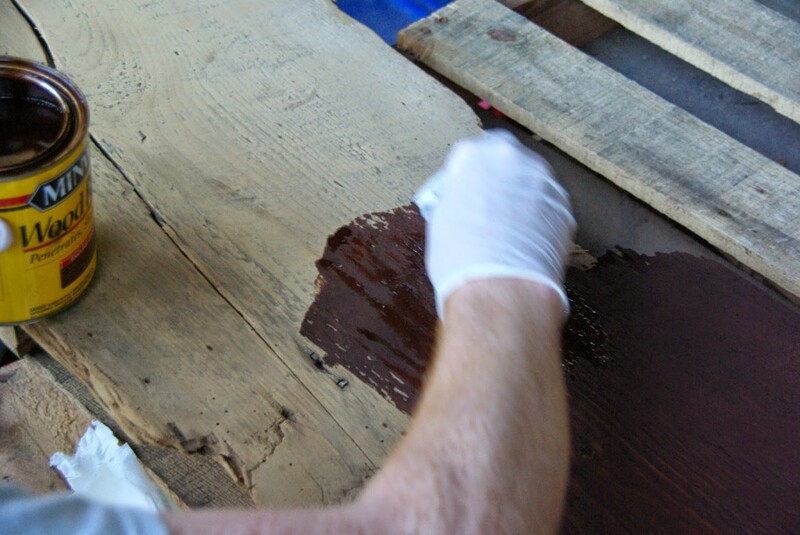 We had one other experience with staining, and it failed. See it here, I wanted to redo some cane chairs. I redid them, and the results was lovely. But not so much the staining. But this time I was positive I could figure this out. 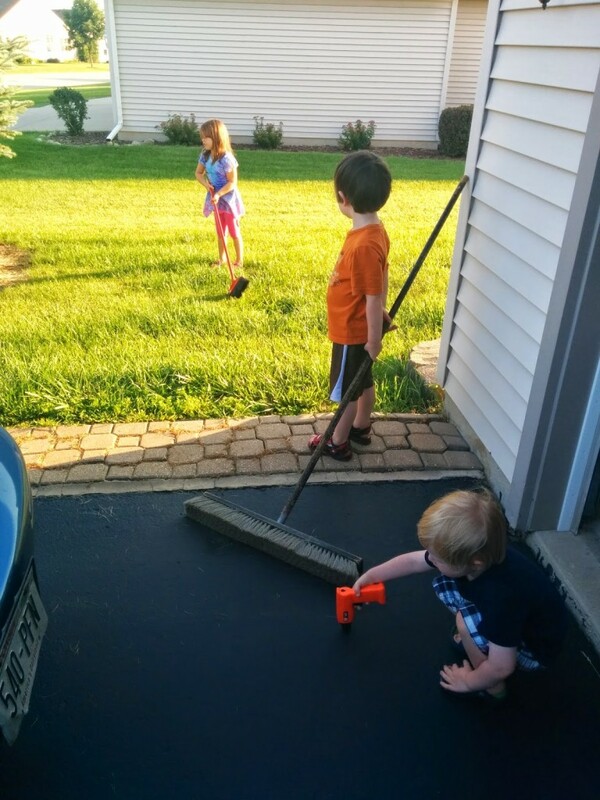 We have raised and kept alive three children, we DIY all the time. I can conquer some staining. And I have Google to help me along too. I first sanded (ugh) the wood. 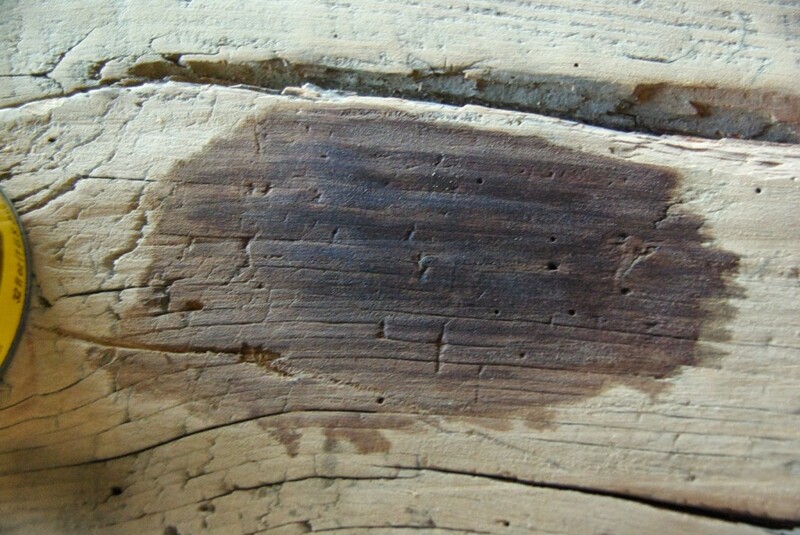 This way the wood was porous enough for the stain to take the wood. 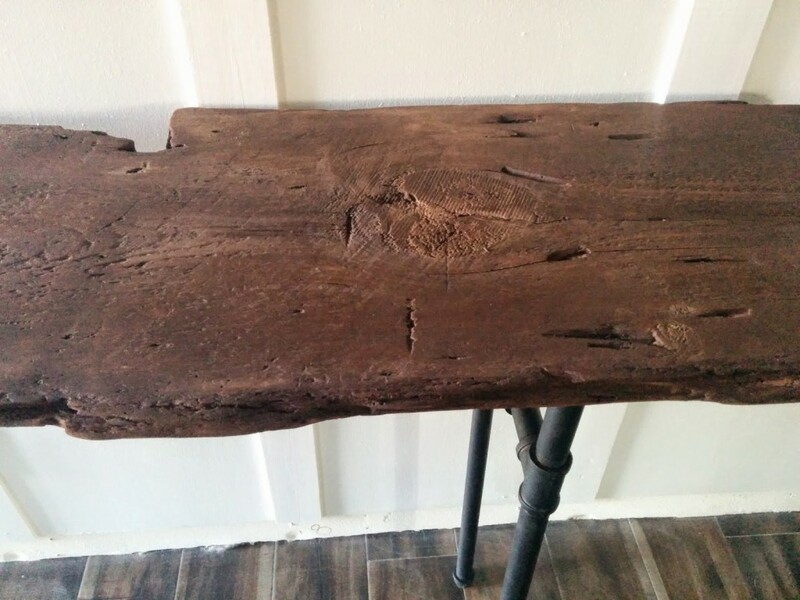 I sanded both sides, and the plan was to try out the stains on the underside before committing to one for the top of the console table. I could not decide which color I wanted. So I purchased two I assumed I would like. Varathane, sun beached. And Varathane, Kona. 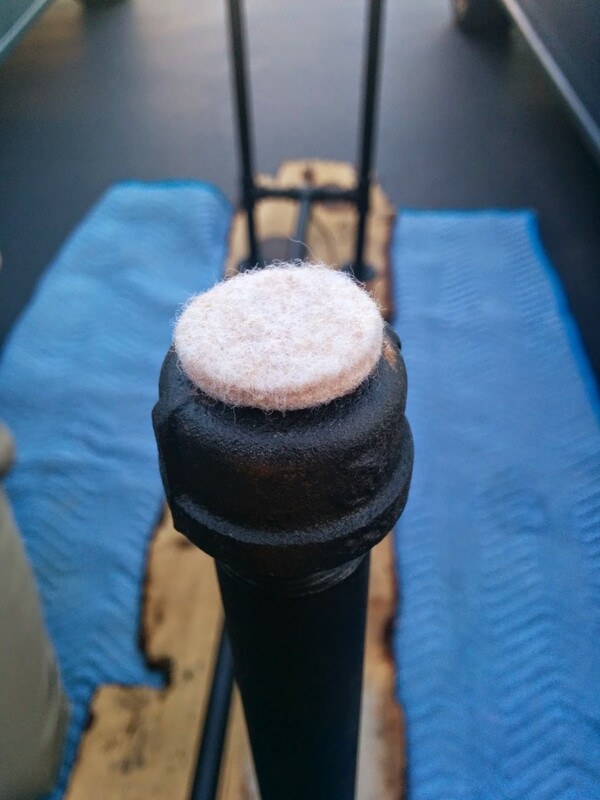 I also had on hand the stain I purchased for the cane chairs. 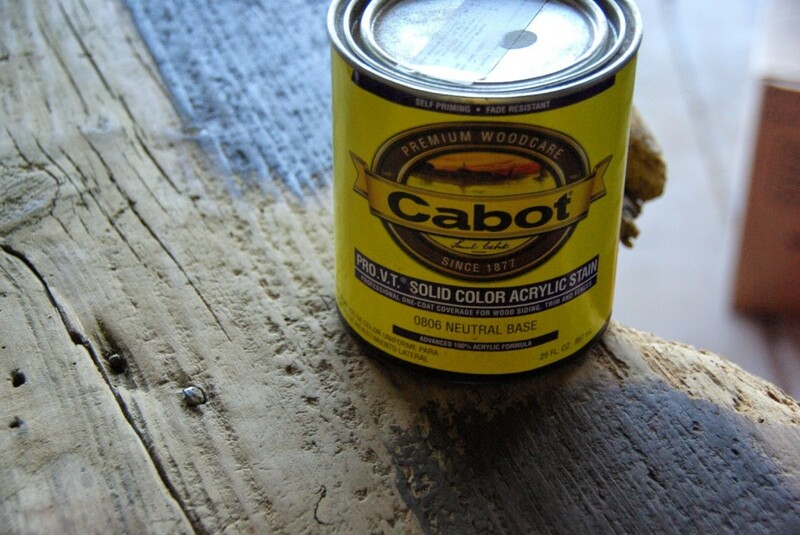 That stain was Caboot solid color acrylic stain. 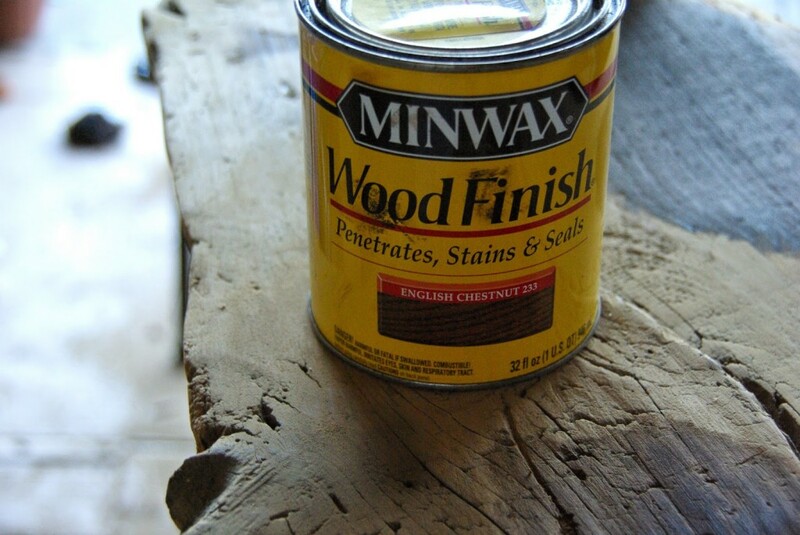 We also found in the garage a minwax, English chestnut. I think my in laws left it over when we bought our house from them. I am not sure what they used it on because to my knowledge and my mother in laws as well they never stained anything. 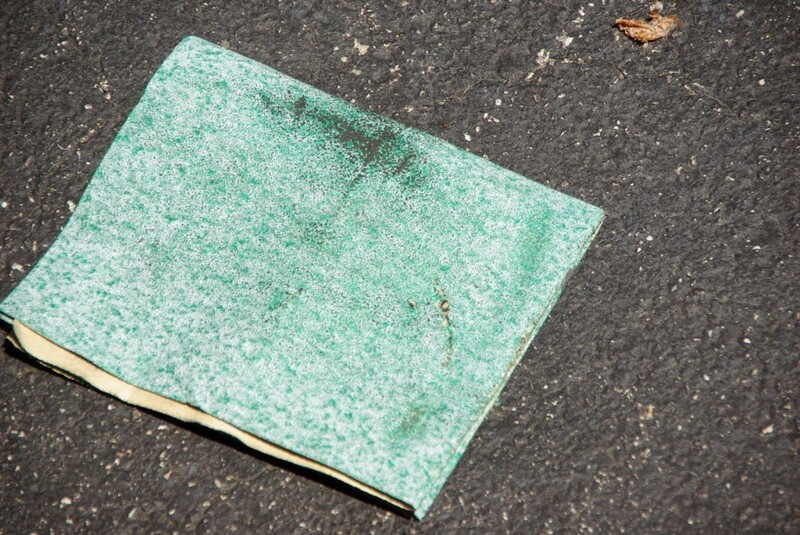 So this mystery stain from who knows where was also put into the mix. 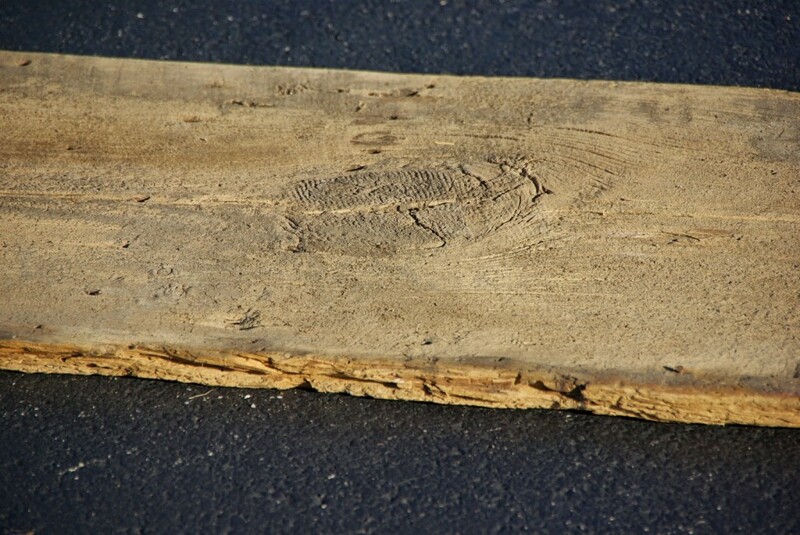 I liked the sun bleached one before I even put it on the wood. I was 99% sure this would be my color. 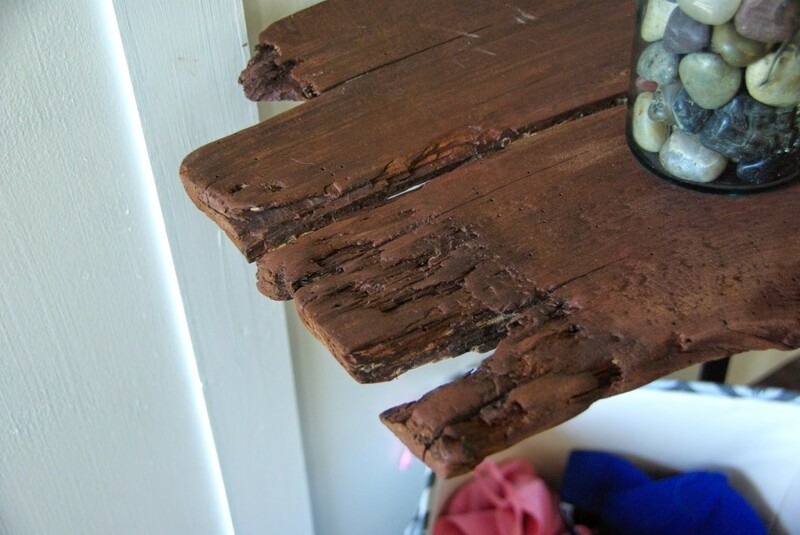 But the second I placed it on the wood I hated it. It was so whitewashed. I know that was the look, but with this wood it did not come off well. Dale loved the Kona. It was dark and wonderful, but it almost matched the pipes with its dark color. I want there to be some more obvious variation between the two. We finally settled on the mystery, dropped from the decorating gods I am sure, English Chestnut. We don’t know where it came from but it was meant to be. 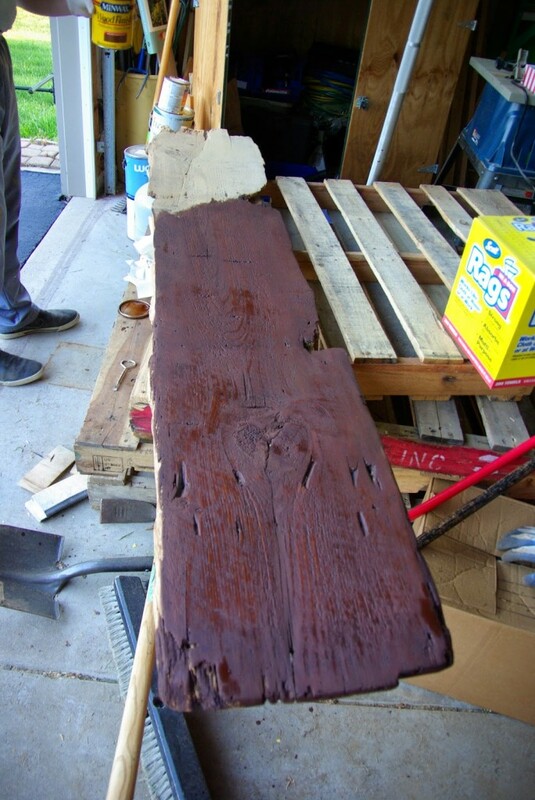 this is what we used to apply the stain. They were sturdy enough to not rip. Normal paper towels would have ripped. 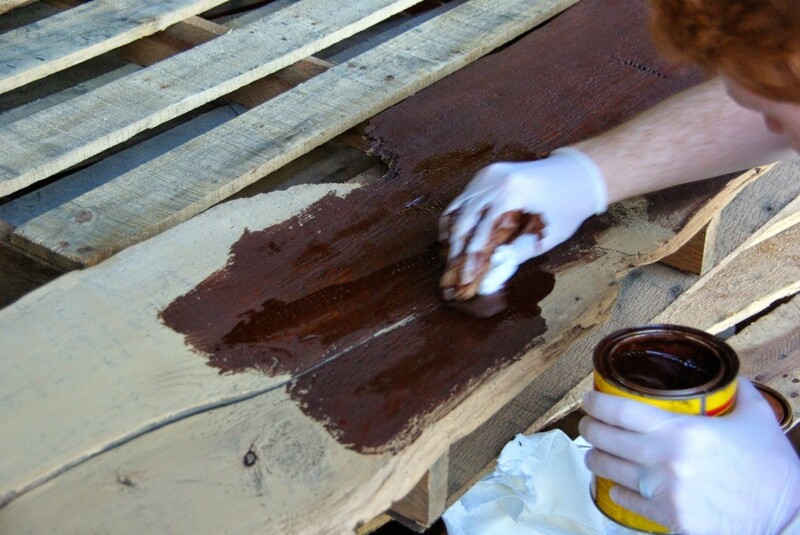 An old rag or shirt would have worked the best for staining. 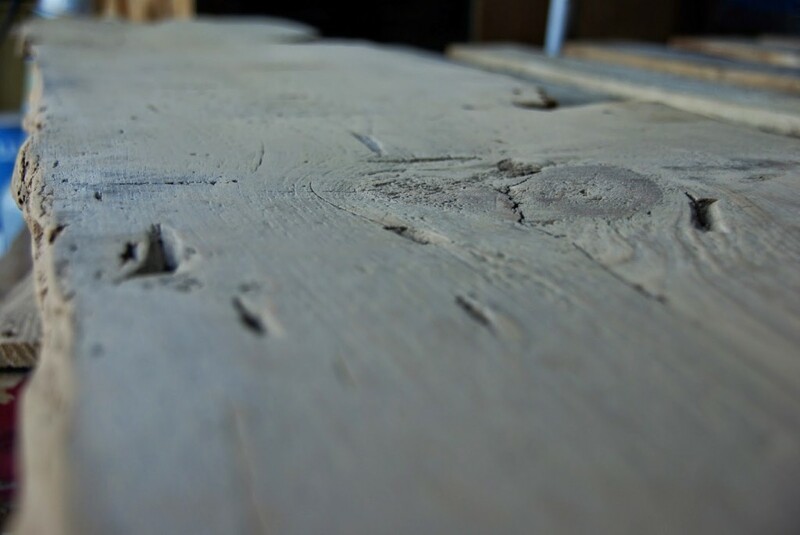 This was how the wood appeared after all of the sanding was done. Staining. 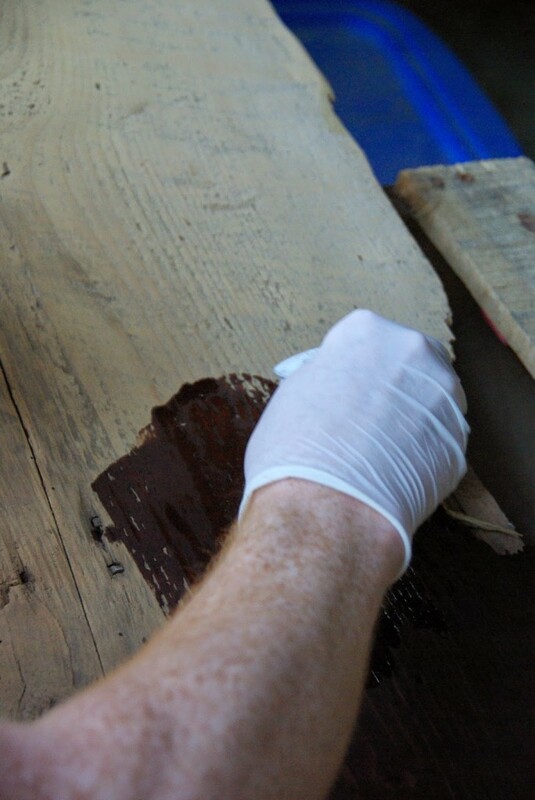 With the wood being so old, we did not have to be too careful on amounts applied to the surface. It took any and all stain. But I have heard with others you do have to be aware of keeping a somewhat standard amount throughout the piece. We just laid it on thick. Starting to move the GLOVED hand from side to side going with the grain. Using the cloth to spread the stain in. 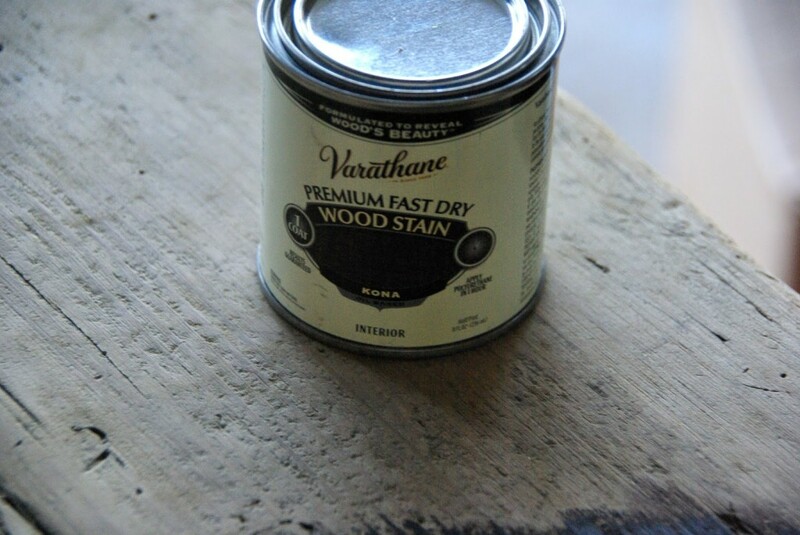 I rung the towel out over the can before applying the stain to the wood. This way there was not any dripping or splotches. We wanted this to look natural. I am not sure if splotches exist in nature but I am thinking No. 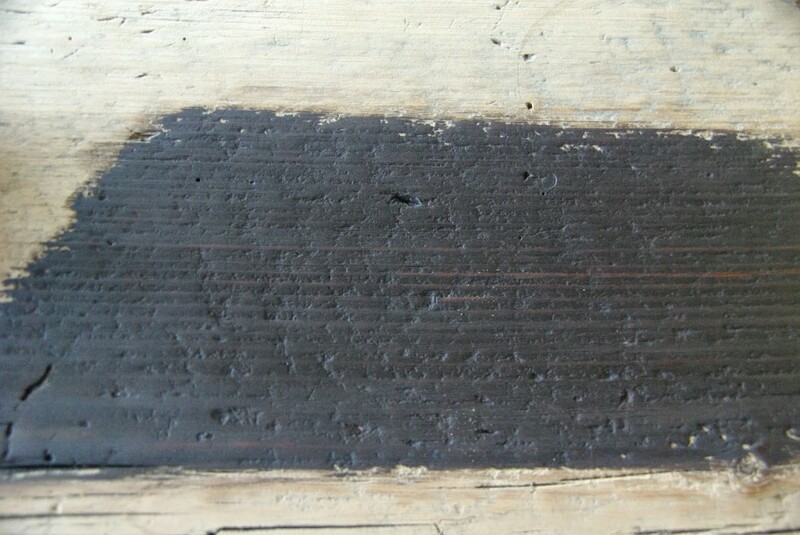 With this being such an old and worn board there was many times we had to go back and run the towel with some stain over the surface again. 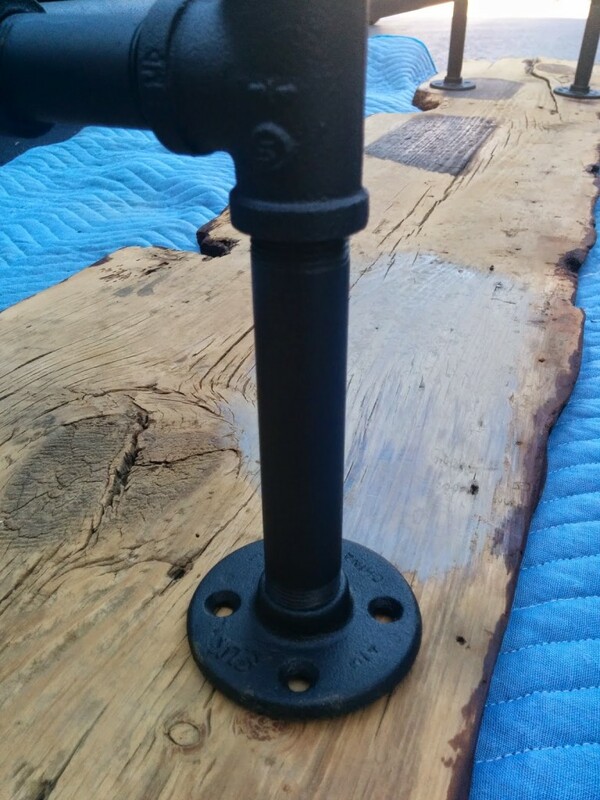 It almost disappeared into the wood as we were staining it. Also if there was a particularly moist spot I took the towel with no added stain to it to spread out the moist area, thinning it out. 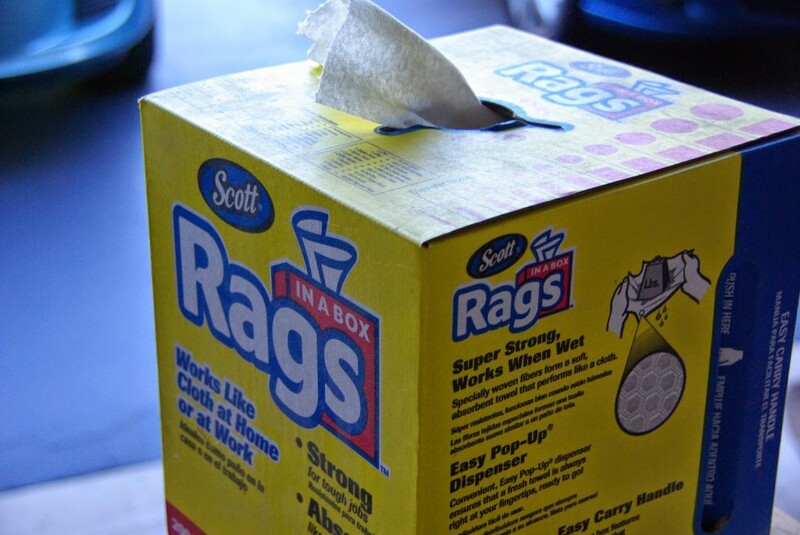 Make sure to get in all of the creases and crevices. We were not committed to one coat or two. I figured with this being our first time staining I would play it all by ear and go where the wind took us. The wind took us to only needing one staining coat. 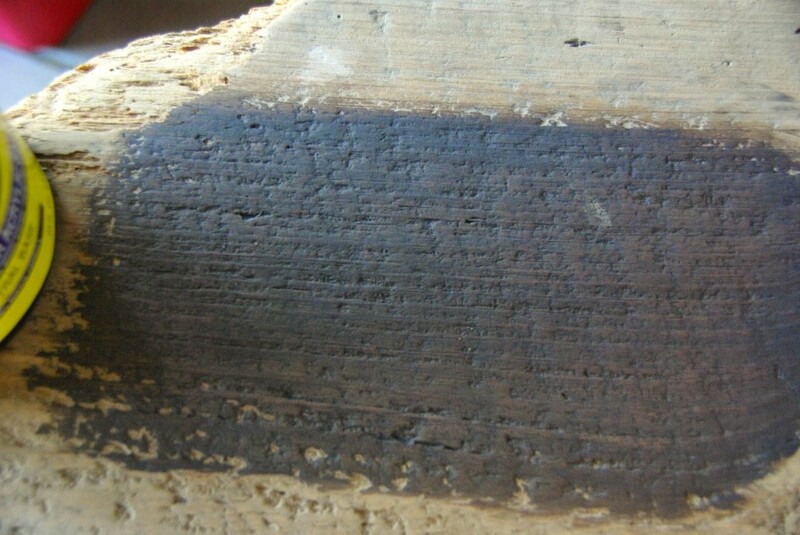 I liked seeing the grain, the distressed look of it. 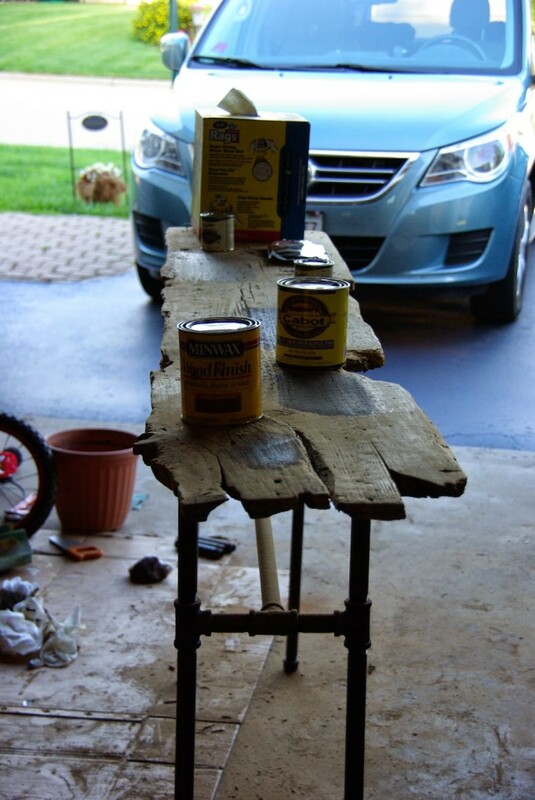 There is no amount of coat or polishing that can make this look anything other then rustic and industrial. So we embraced it. So one coat and we waited for it to dry. I was jumping excitedly because we were thisclose to having it done! I could just imagine what I was going to display on it. But we had a plethora of galvanized pipes to assemble. This is the worlds weirdest puzzle. We did a lot of scratching our heads, trying to remember what we planned to go where. 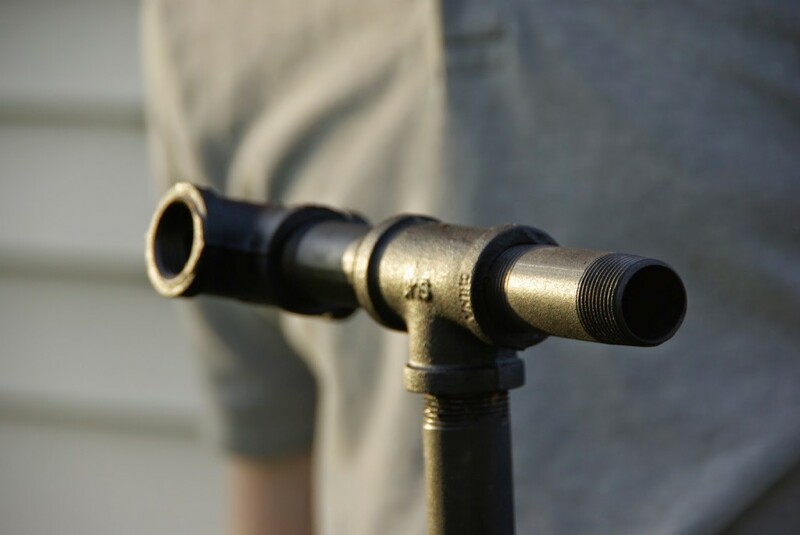 You take each pipe and literally screw it into each other. They have tracks so it was fairly simple and easy. But we had one problem. We set it all up, on the lawn like normal people. “Hello lovely neighbors walking your dog. Just us, our dog Teddy and three kids running around while we build a console table. Normal stuff here in suburbia, right?” Anyways, it was pretty, galvanized, industrial. The legs and all were perfect. But it was tall enough to be a bar. We don’t have a bar, I don’t drink. And my Hubby is the kind of drinker that relaxes on the couch with his feet up and a beer in hand. Not a sit at the bar and discuss… whatever people discuss at bars. So this was a problem. The initial table sat 39 inches tall. It came up well past my stomach. So guess what we got to do? A random not planned run to Menards, our local home improvement store to purchase shorter pipes. 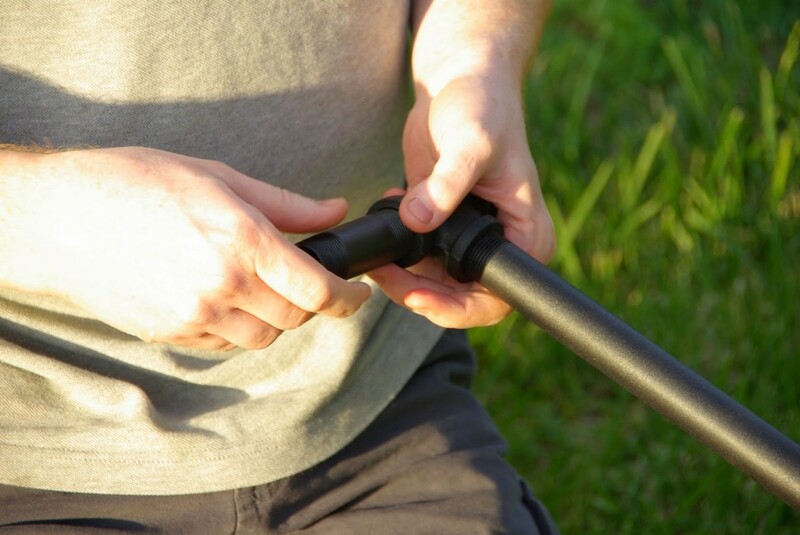 We decided to shorten the top 4 pipes that come up from the break in the pipes with the one going across the center. 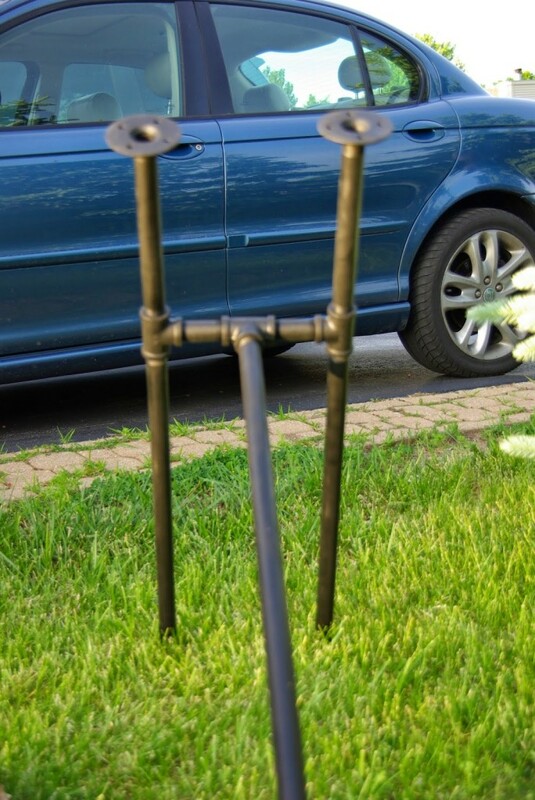 We purchased four, 5 inch long pipes. Cut that baby in half. Well not the table. Then it would be a coffee table. But the other pipes, the top ones are now in half. Queue the begrudging sanding and painting again for these four unplanned additions. But it was worth it. The table was way too tall. 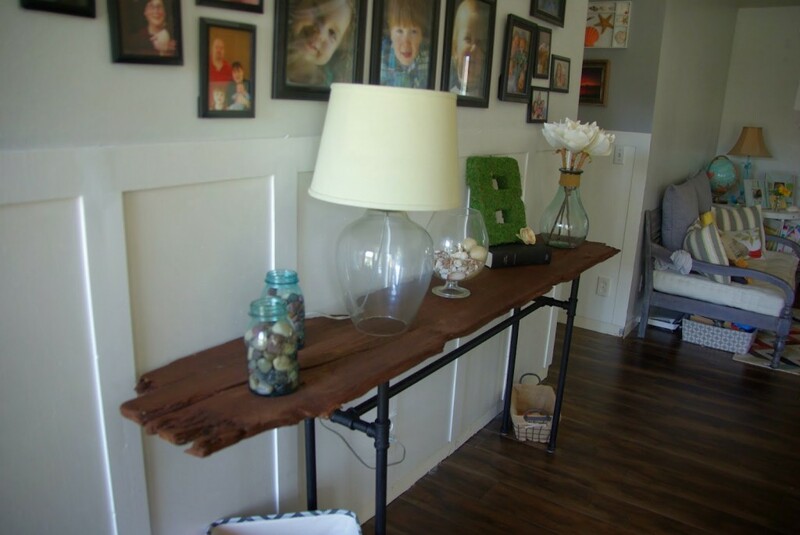 It would not have worked as a console table in our living room. It would be like one of your darling kids. The light of your life walking around with their head up so much all you see is nostrils. No amount of cuteness will take away from that. 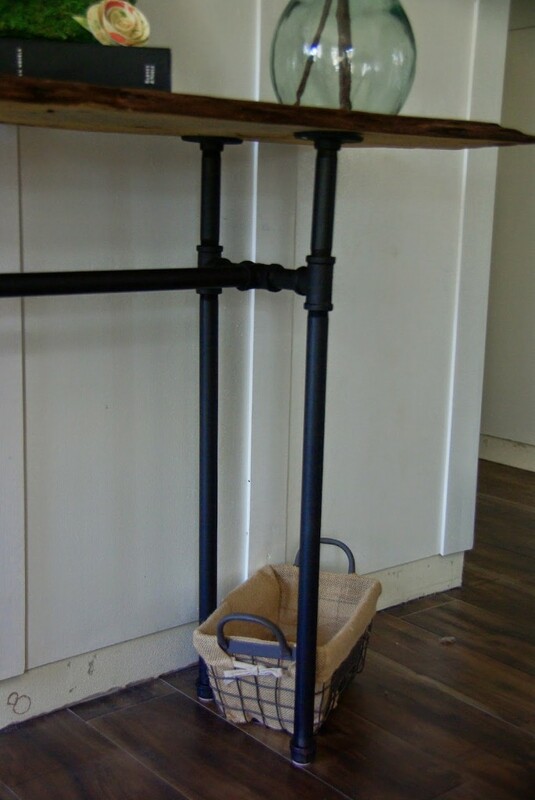 All we saw with this table was some pipes and nails. 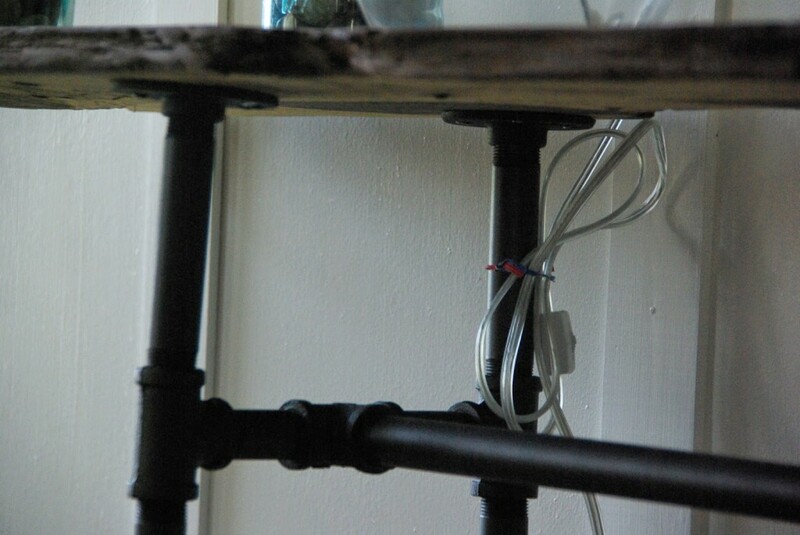 The console table equivalent of nothing but nostrils. But we fixed it. 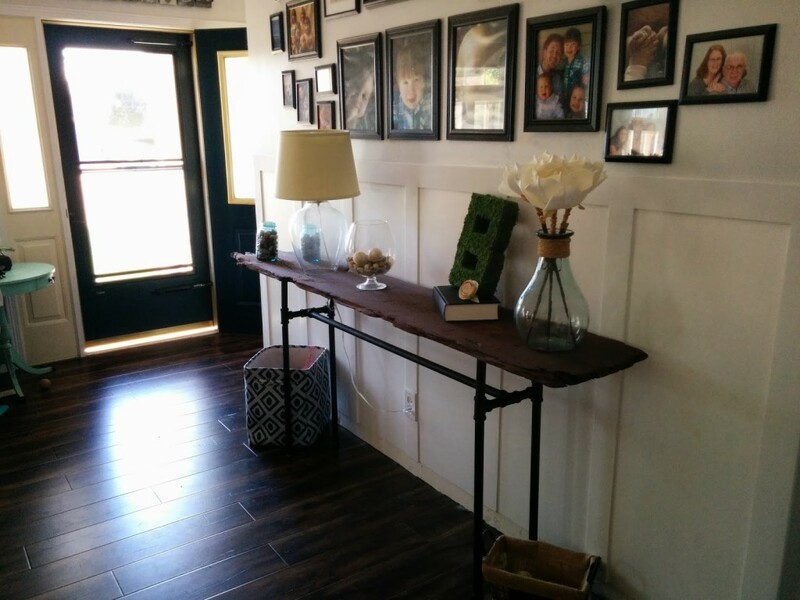 The table now rests at a modest more console table like height of 34 inches. 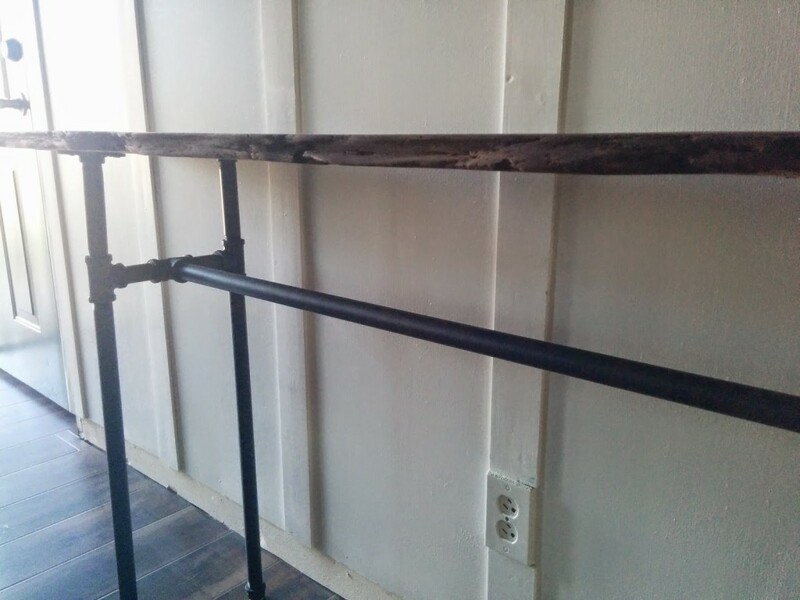 So once that was all remedied it was time to make this old piece of wood, and these galvanized pipes turn into by dream console table. Initially we had planned to cut the wood down to size, probably 1 foot off on each side. But a few problems arose. One, where I wanted to cut it there is a big chunk of wood missing. So the circular base’e would be seen. Short of cutting a piece off and gluing it on the missing chunk it was un fixable. And two, we carried it inside to see how the whole thing would look and I loved that it took up almost the whole wall. 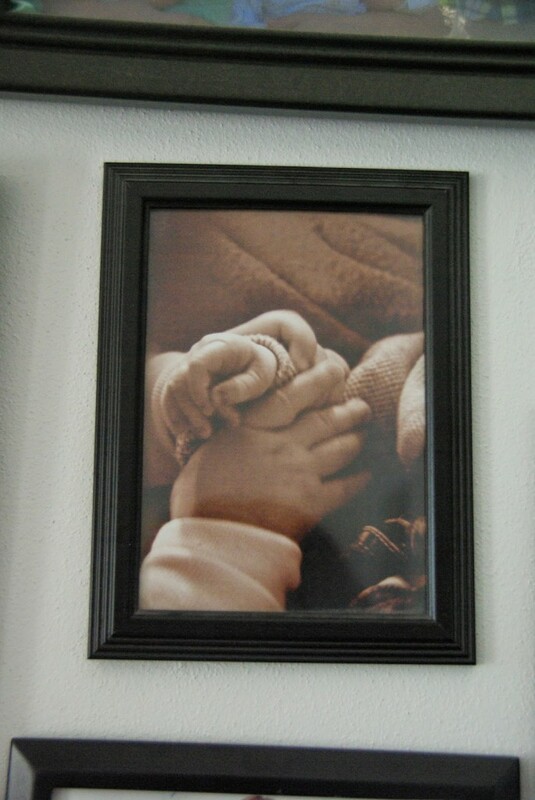 It is a big wall with a gallery wall of family. Some DIY board and batten. But not much else. 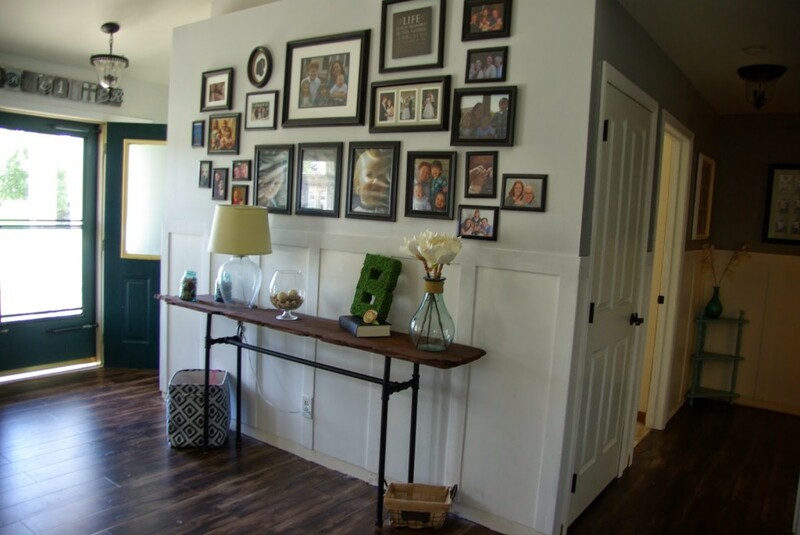 It also will never be a greatly functional space because it is the main way to get in the living room. It needs to stay clutter free. 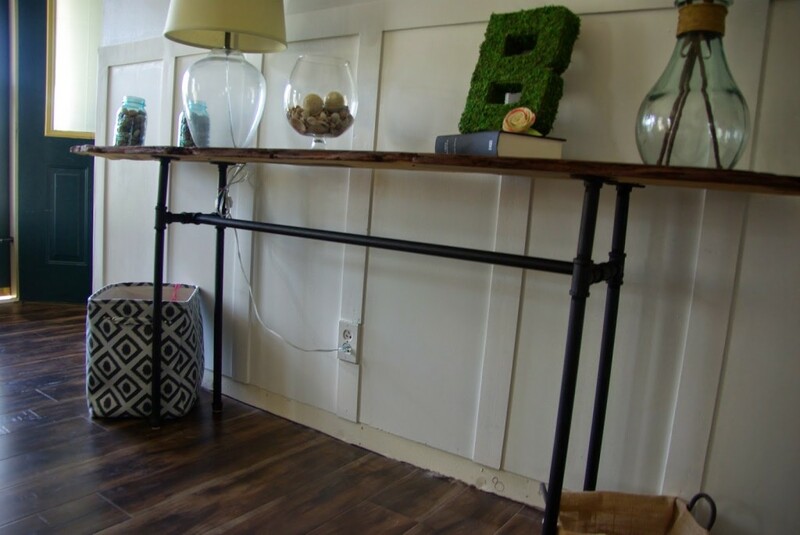 So a long and skinny console table 7ft long is perfect! Once that was decided it was time to make it happen. 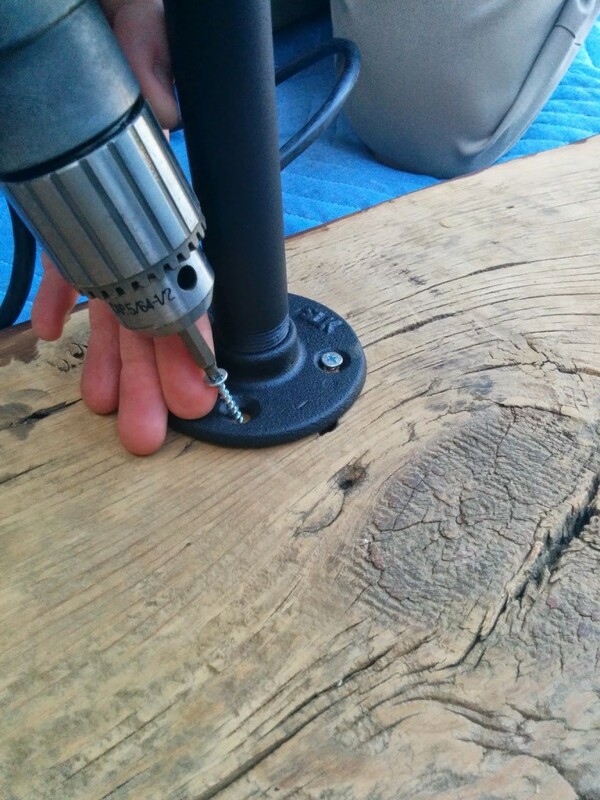 Using some screws and a automatic drill we went to work making this into the console table. 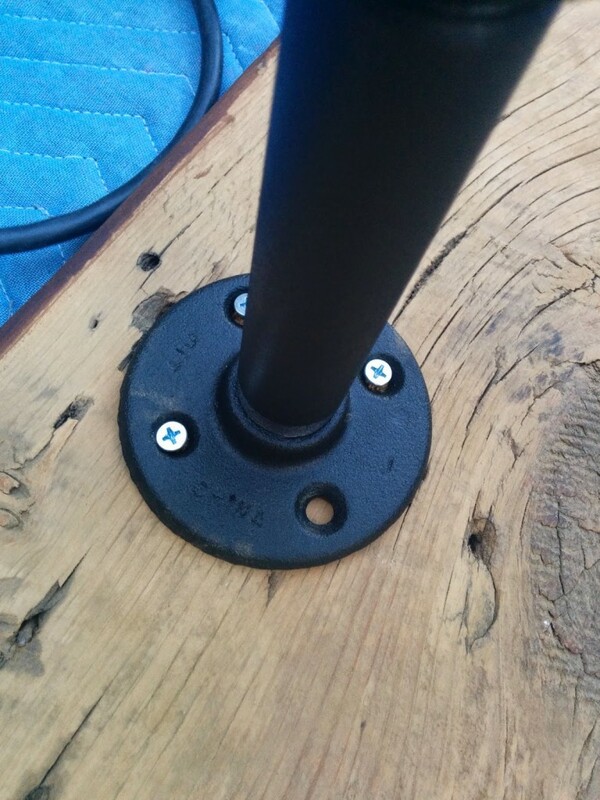 We were careful drilling in because it is such a thin wood I did not want the screws to come through to the top. So, drilling in slowly to see where it ends up was very important. I also added some nice floor protectors to this, we have this on most of the pieces of furniture. They are super easy to put on and for the most part stay stuck. It allows our beautiful and factory distressed floors stay that way. As each screw was going in I was getting more and more giddy. 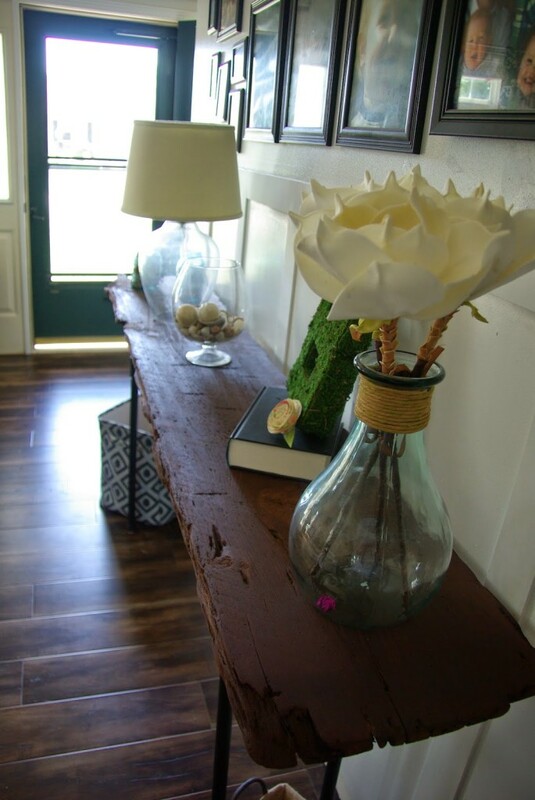 I could see the light at the end of the console table tunnel. Not that this was a particularly grueling project, not at all. But to be honest I always like the results more then the process. And these results are more then I was hoping for! And now the TADA! With a gazillion pictures…. 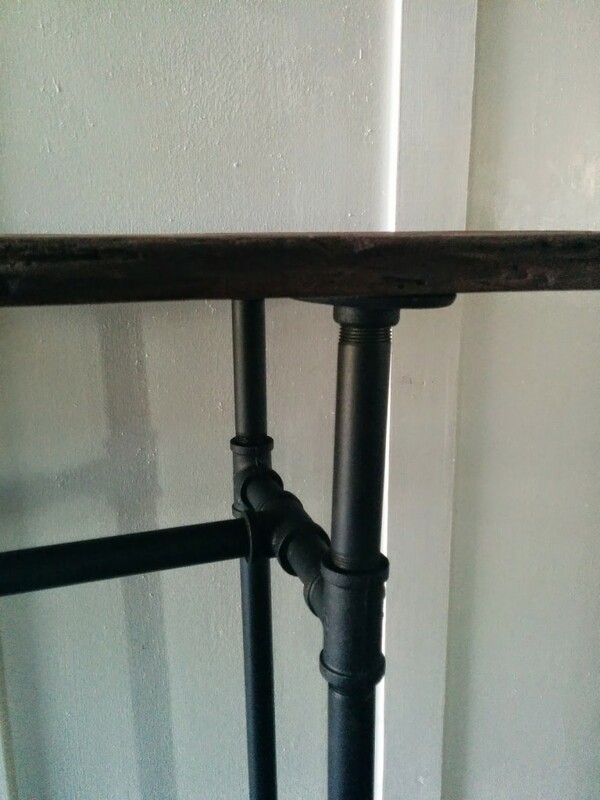 the shorter pipes were used here on the top. I actually like it with the center bar being up higher on the legs. 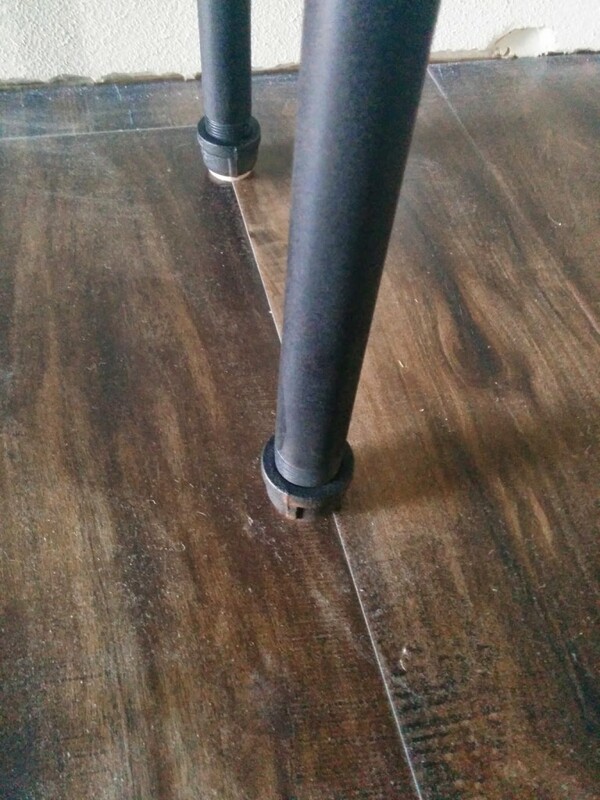 Oh, this table is missing one thing…. stuff! 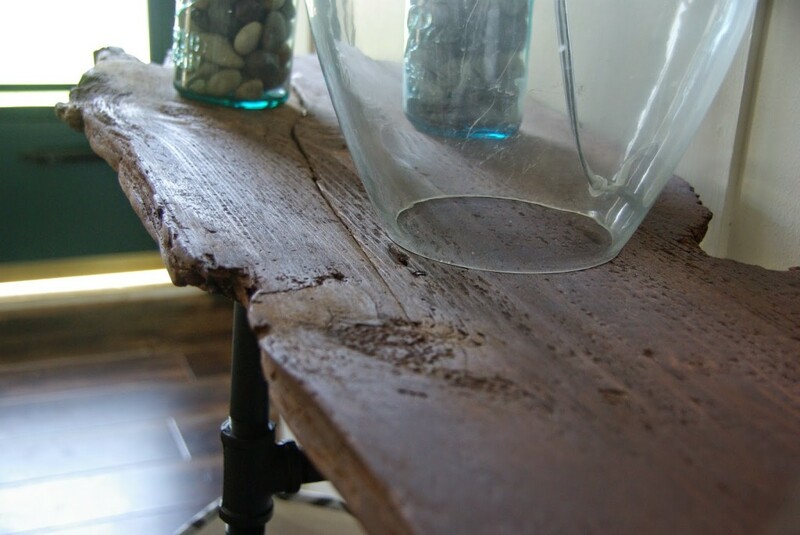 The knots and distress in this table is gorgeous! Full disclosure I worried this was too rough right here. But I love this spot. 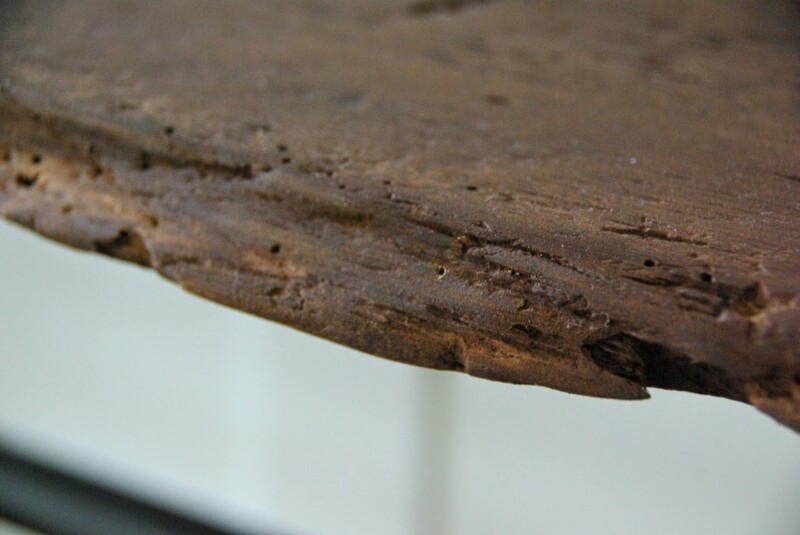 It is all softened up with no sharp edges so the lovely aged wood can rock on. I did leave out one thing. We have a clear poly urethane coat to slather on this. But like I said this project was just done. And I was too eager to not set it all up right away. We will be adding the clear coat to this to protect the wood and seal in the stain. It will be done in a day or two and I will share a few pictures of it once it is done. 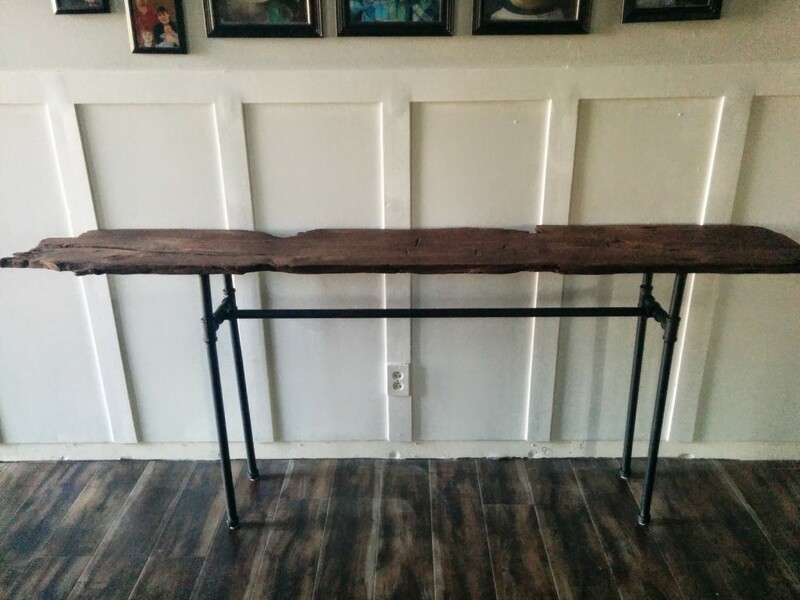 But this industrial console table is so beautiful if I do say so myself. It is much more rustic then I would have gone for when I started out decorating my house. But as time has gone on I have enjoyed mixing bright and bold colors, with soft colors. Country and rustic with sophisticated. My style is the epitome of eclectic. And this table fits right in. Total I spent around $120. It was more then I expected it all would cost for the supplies. But still cheaper then one bought all done. Either custom or from a store would be around $700. I saw some for a little less, and some for more. But with the size of this table I would expect it would be on the expensive side. 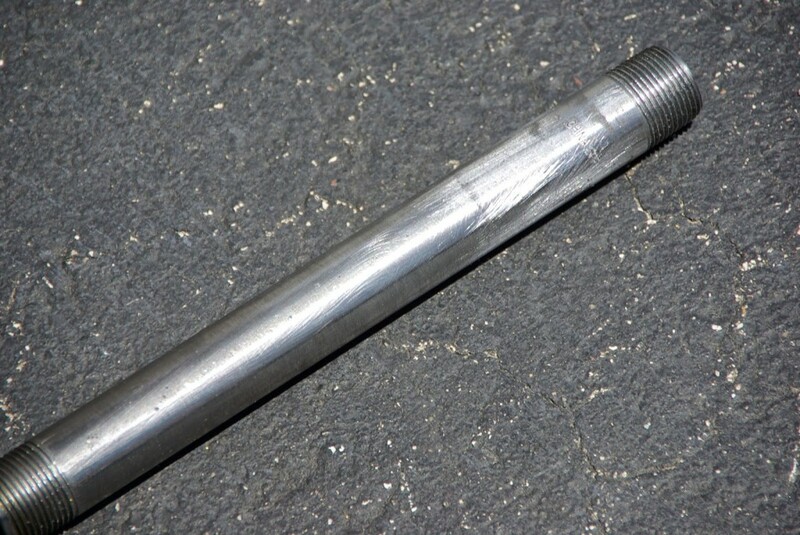 This is my second project using galvanized pipes. I think for now I am done. I don’t want to go too industrial and rustic chic. Finding the balance is key. 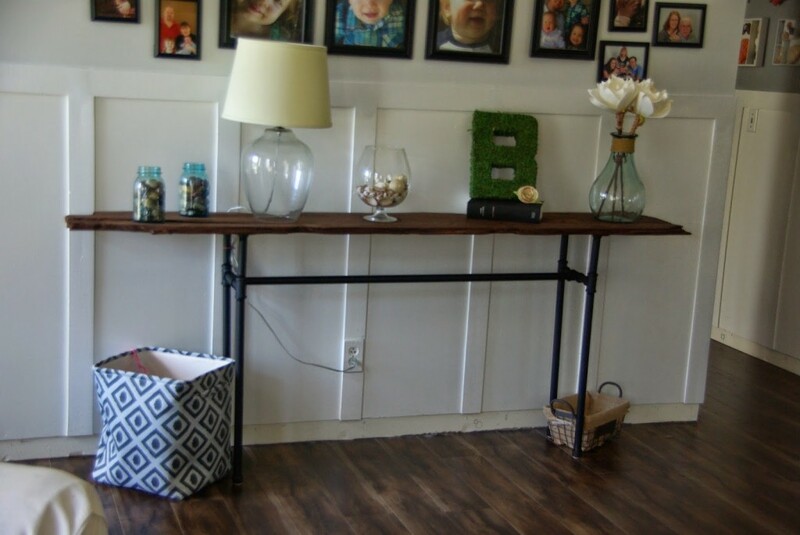 But this console table is a great addition. And anyone can do it, I promise you. I have had a few people already be in the house and ask where I got it. I puff up my chest with pride and say “We made it!” And my husband gets to say he was right in knowing he could do it himself. Now he gets to eat his words though because I know he can make me ANYTHING! 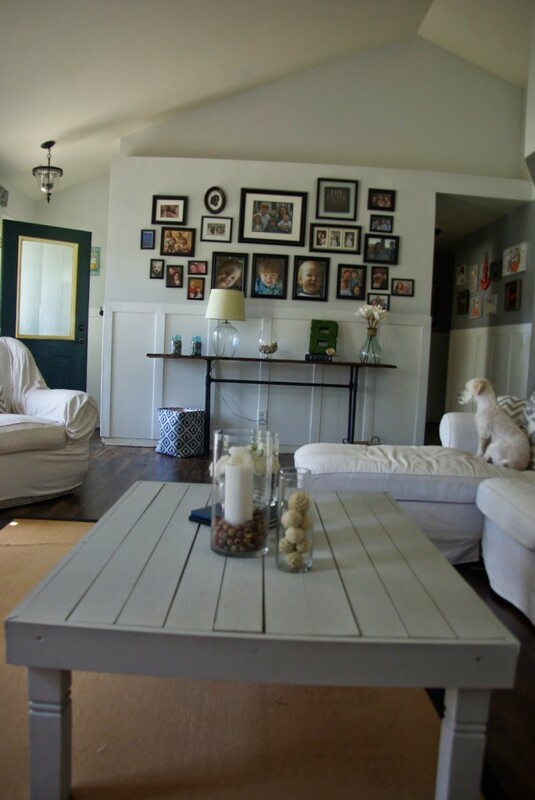 The sky is the limit for this home decorator and DIY-er! I did not go all "cave man" Yeah…eee…uuhh! I'm done. 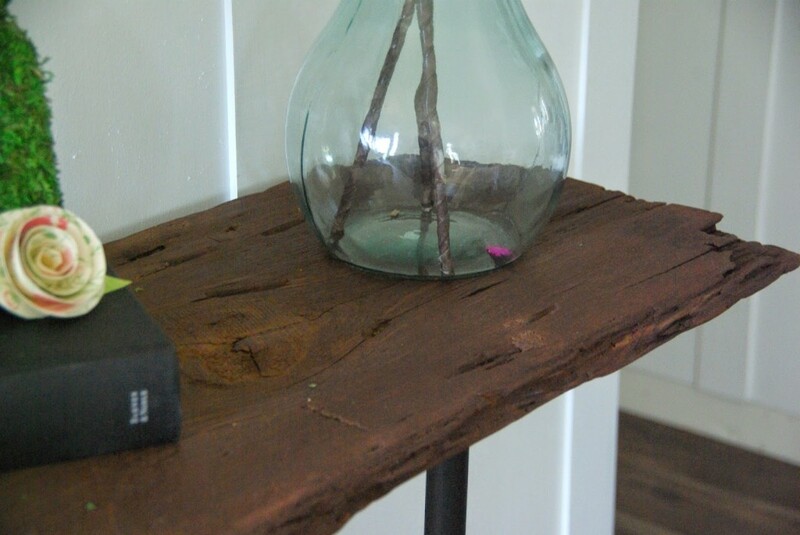 Here is your console table. It looks really nice and very authentic. It might be not so easy to make as it looks, but you can make it just like you want, size and colour and so… It's better than looking for the perfect one and never find it… Would be nice for our home as well! it was easier then I expected actually. And yes, it is nice to make it exactly how I want it instead of making something store bought work for me. I am so happy you stopped by! This looks AWESOME- great job on this project! 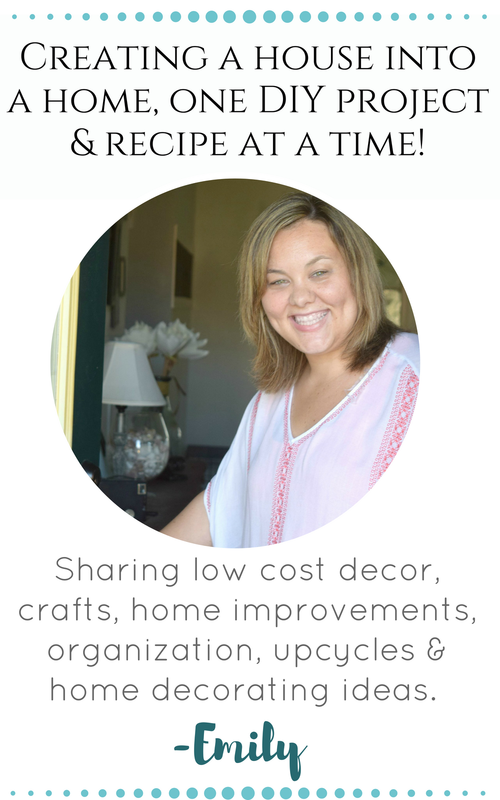 Totally our style, too- thank you for linking it up at Snickerdoodle Sunday!! Looks great, Emily! I love how the console complements the color of your wood floors. thank you Theresa, it was a happy accident to use that stain. I was not planning it all to match so perfectly. But it did! This looks great! I never would have imagined the board would look so great with just a little (or a lot) of work! Great table. Thanks for linking up to Snickerdoodle Sunday? Thank you, I had a few people thinking I was crazy with how rustic it was. But that was what I was going for. I love this. I don't have anywhere to put it but maybe someday. 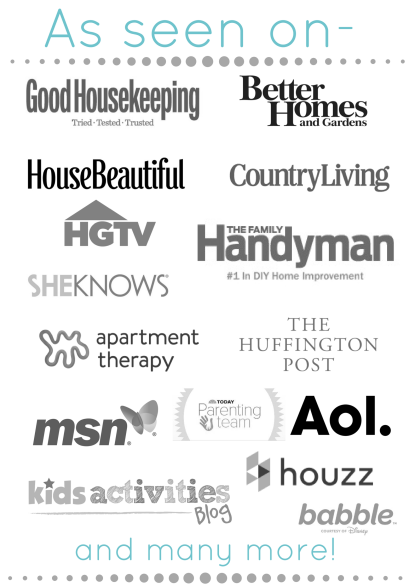 Thanks so much for sharing at the Say G'day Saturday Linky Party! I just pinned this. I love your table! Thank you so much! I always enjoy linking up! 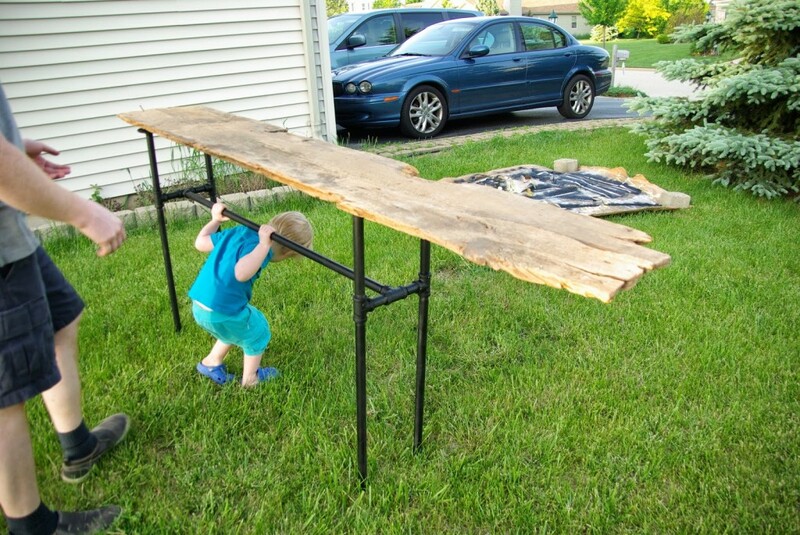 What an awesome table…love how this turned out! Awesome table and tutorial! You guys should be proud of yourselves! Thank you! 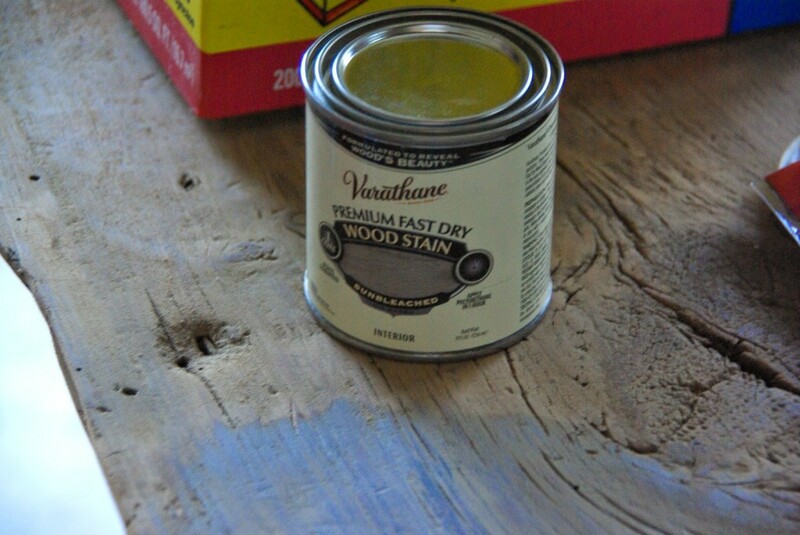 I am, I was worried with me never staining anything before. But now I know I can stain anything! SUCH a gorgeous table!!! 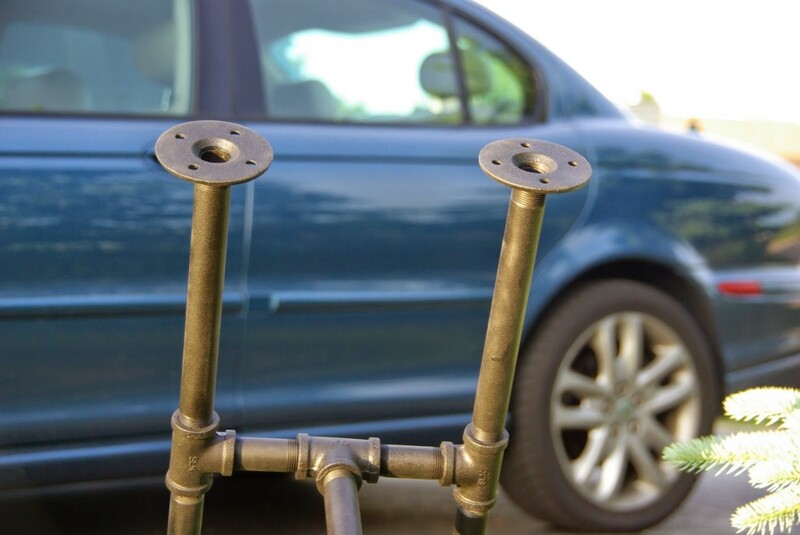 Brilliant twist tie idea too!!! Thank you! My Husband Dale came up with that idea on his own. It was a win! Very nice tutorial, and the rustic look is gorgeous! 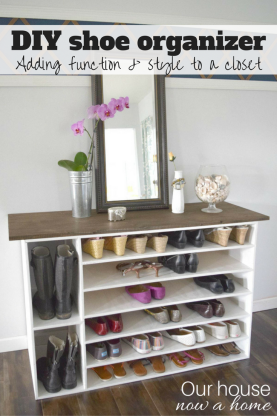 I love DIY projects and this is a fabulous one! Thank you for linking at #MerryMonday! Thank you! I have been slow to add rustic. But I think I am catching on in a bug way! 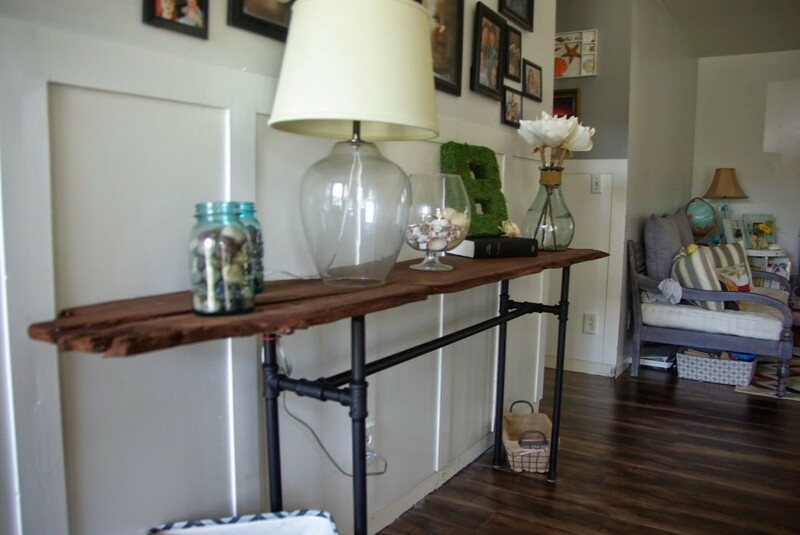 Love the rustic industrial look! 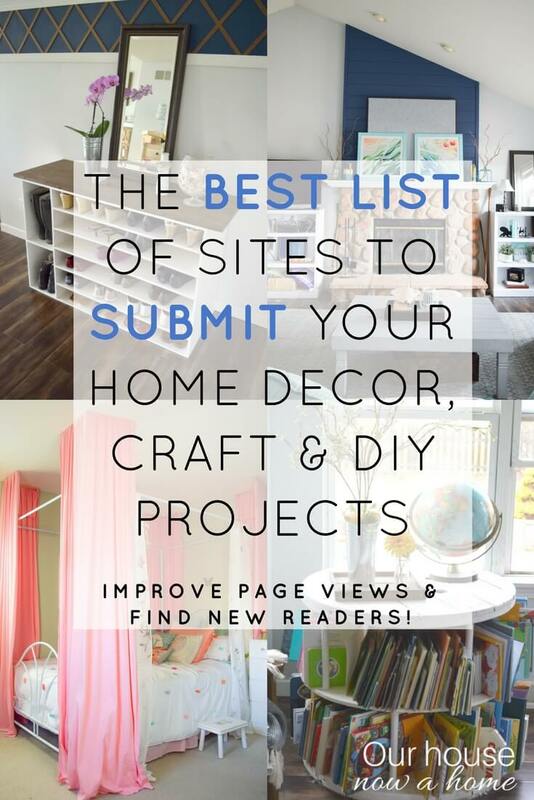 Your awesome project is being featured tomorrow at Your Designs This Time! Thanks for sharing with us. Oh wow, thank you so much! I will be checking it out and linking up again! This is such an awesome piece! Thanks for sharing it at Work it Wednesday!! I will be linking up again for sure! 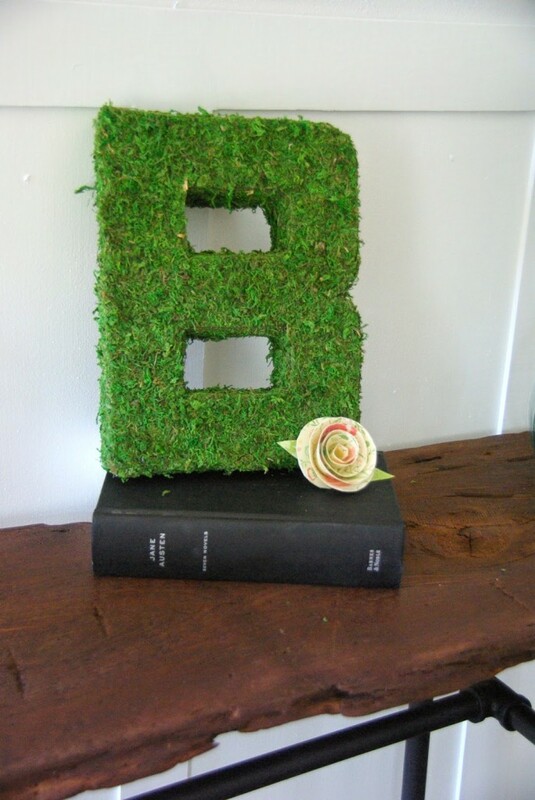 Saw this on Enchanting Inspiration and LOVE it!! 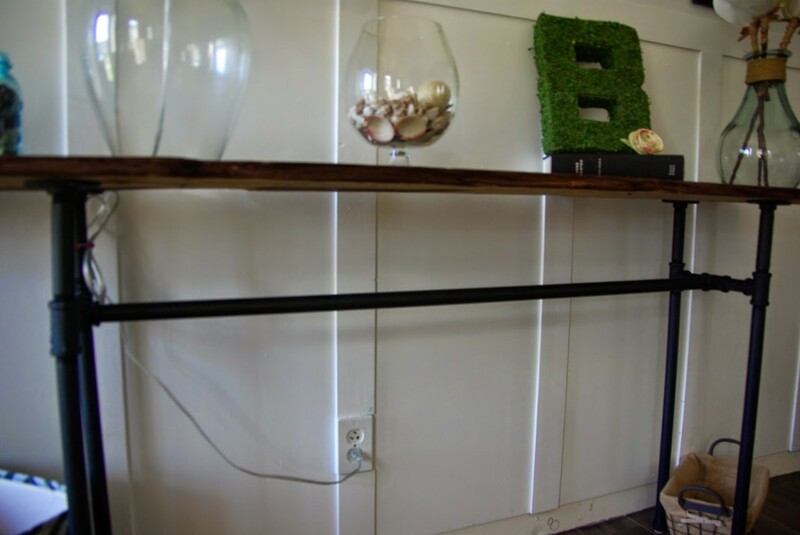 Our entry console table is a bit too wide for the space and it would be great to do a custom piece like this to fit the space better. I'll be on the hunt for a cool piece of wood! Emily power!! AHHHH! 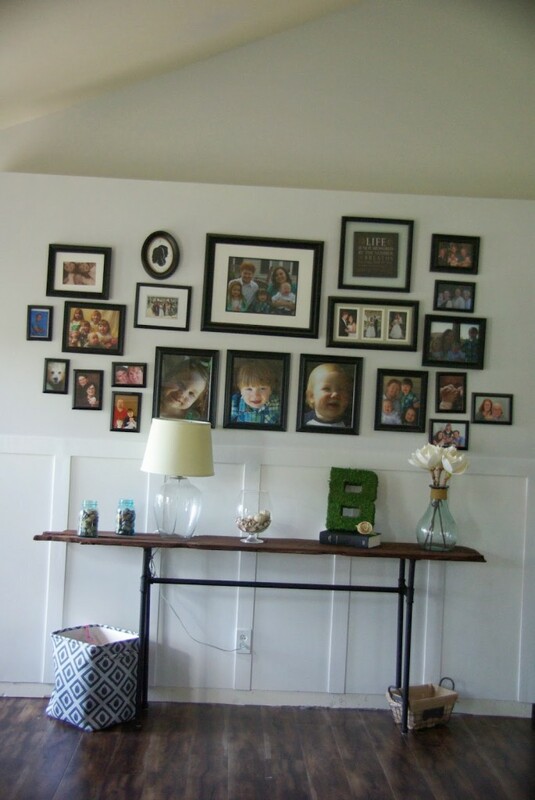 I am in love with that table (and gallery wall to be honest!). 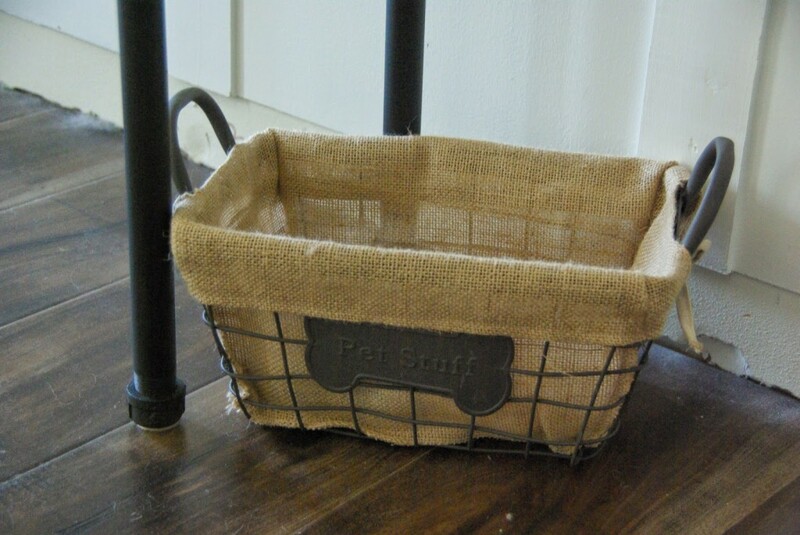 I need to add some re purposed items into my house! Thank you so much, you are very kind. I am on a big time re purposed kick. 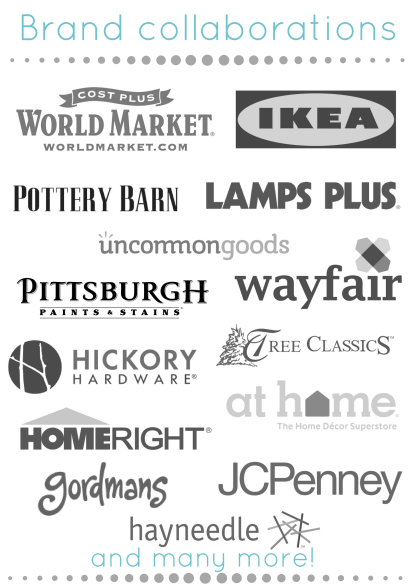 The cheapest way to get some great pieces into my home. 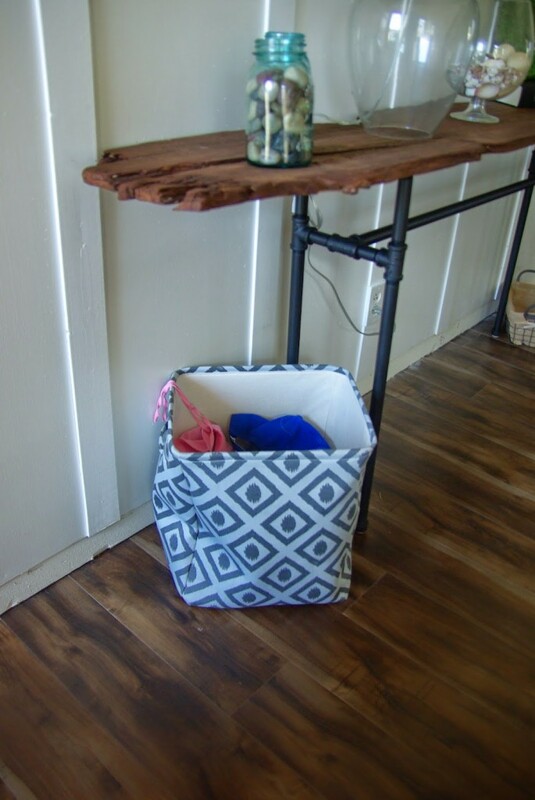 This is a really fantastic upcycle. I found your post over on IBA, and I'll be sharing this on my Facebook and Google+ pages. Aww, thank you so much! I will be going to follow you now. This is a great piece Emily! I'm smitten over any with piping and WILL be making a table soon with them. 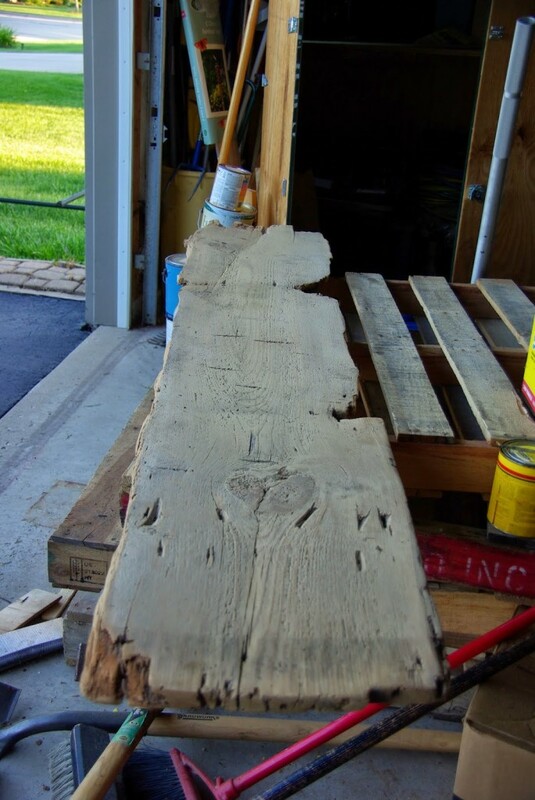 Great piece of wood too… Love love!!! Looks fantastic in its new home! 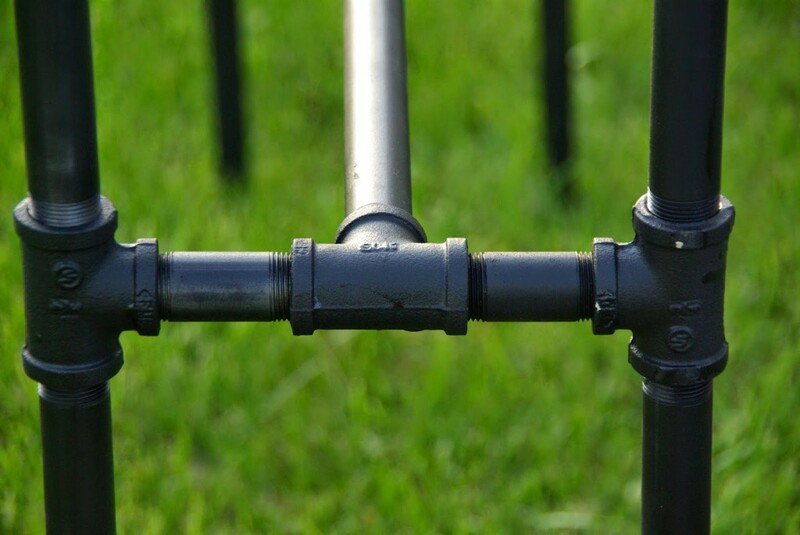 I am in a major love affair with galvanized pipes right now! 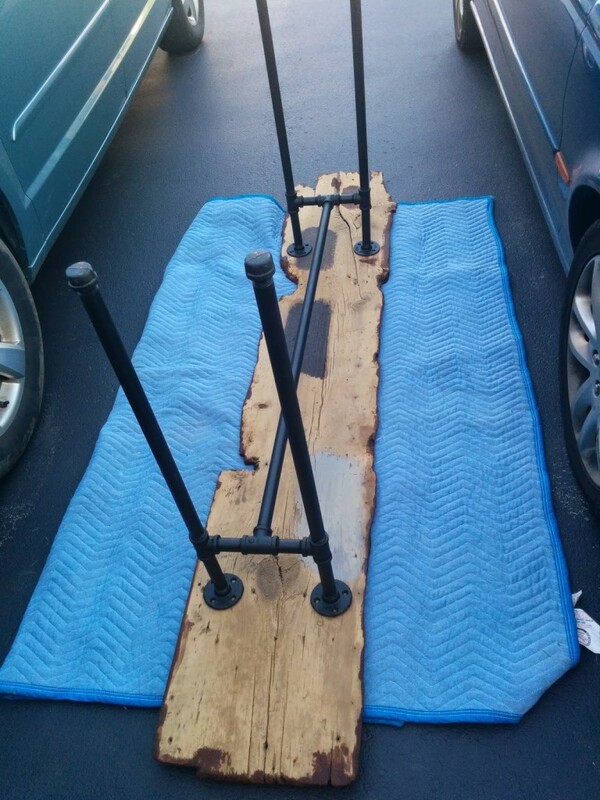 The wood was a lucky find at a barn sale, everyone thought I was crazy for thinking it could work. Can't wait to see how your table turns out Sara! WOW, that is so beautiful, I love how its so unique. Thank you April! 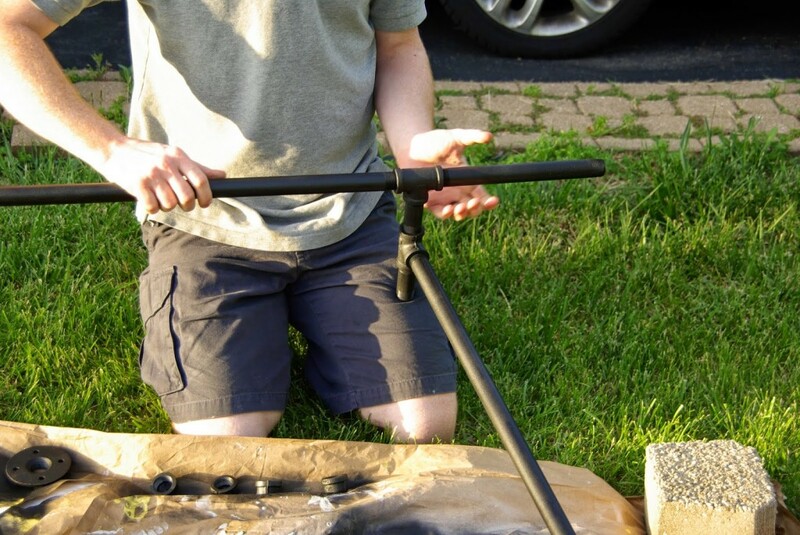 I think with projects having pictures for all of the steps is helpful, plus people can just skim through (which I know they do) and still find it all helpful. I am so in love with this – its' gorgeous!! I am thinking of starting a DIY blog, I get so inspired by posts like this!! Thank you! I adore thinking of things, creating and sharing it with others. Any and all skill, level, projects and styles are welcome for a DIY blog. There is always someone out there who will love what you share. 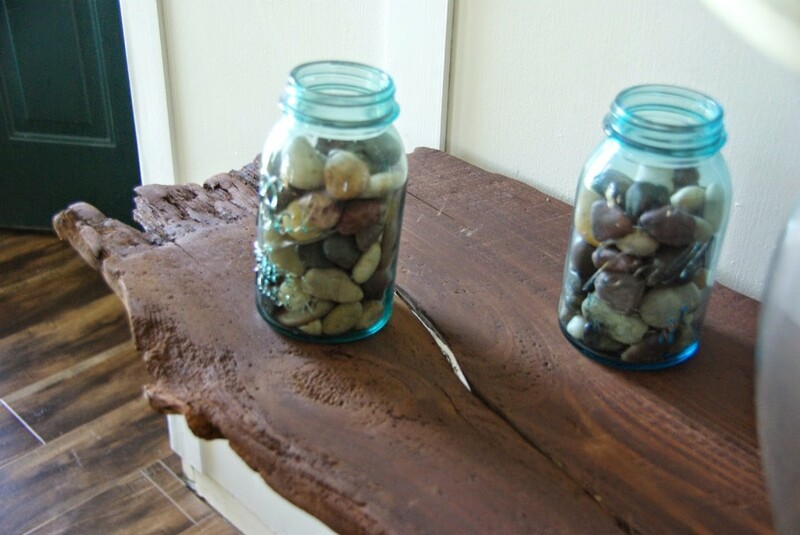 What a cool DIY! I love the finish on that stain. 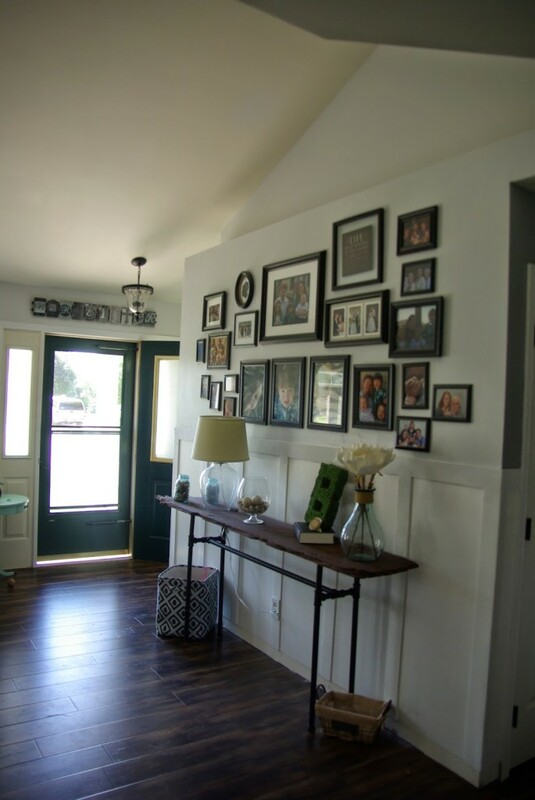 Love the gallery wall too! This looks great!! Love that you made it yourself. The stain color is gorgeous! I looooveeee this!!! 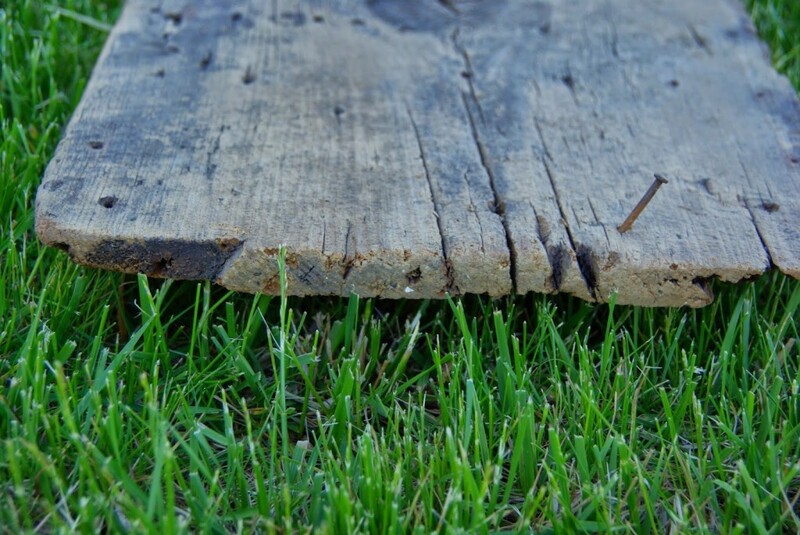 That piece of wood makes my heart go pitter patter!!! I would love to find a piece like that somewhere!! 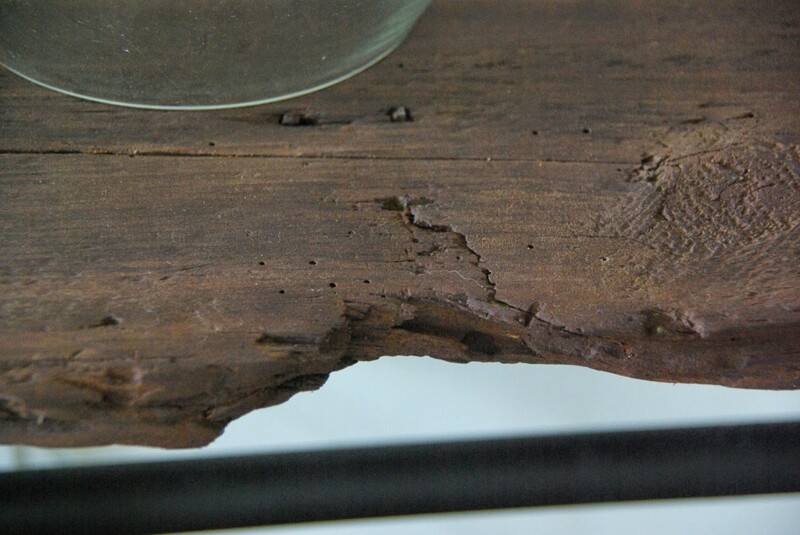 Thank you, I instantly fell in love with the piece of wood also. 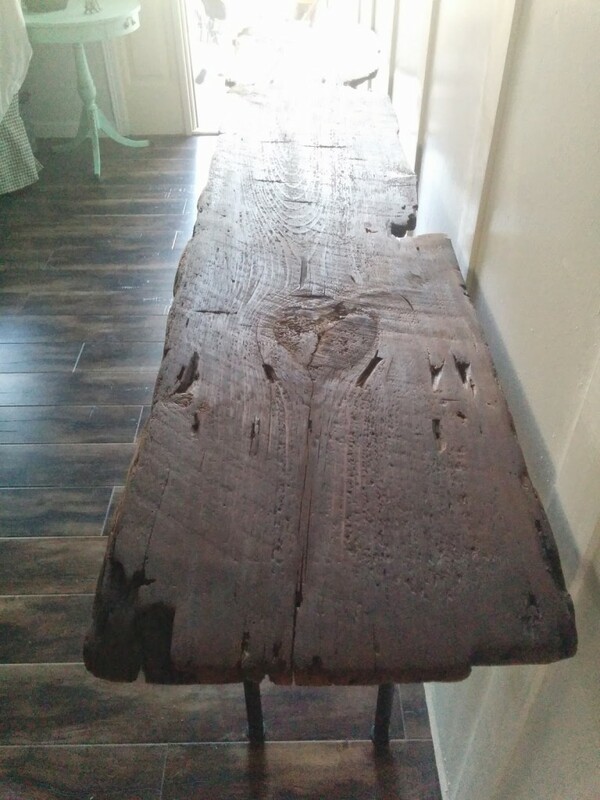 It is legit, came from a barn reclaimed wood. This console table is front and center in our living room and entry way, it is one of my favorite things we have made. This is pure smarts! I love the look and you did an fantastic job! I will share in stumble today! Curious if the dimensions you gave for the black piping is before or after you discovered it was too high. 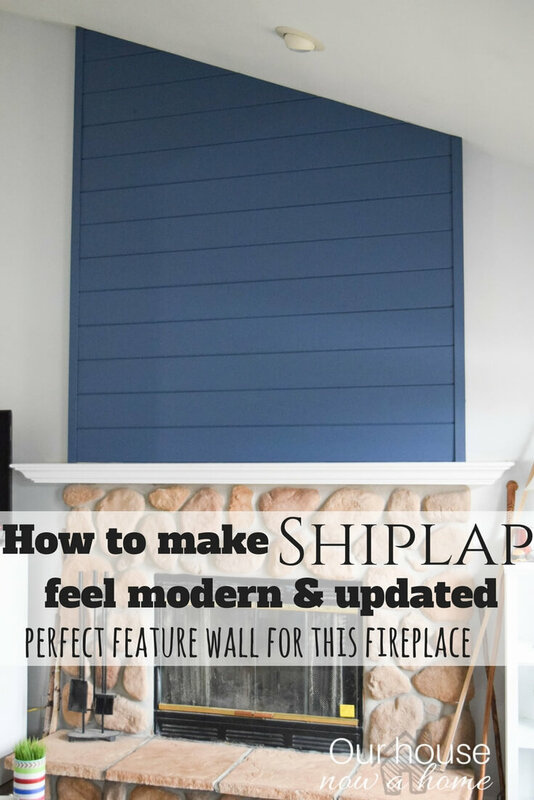 Love this and already have my wood…excellent directions and detail! Thanks!? This is brilliant, I will definitely be sharing on social media! Wow, that’s amazing! Saved yourself £400 ish and you’ve got one just the way you want it, especially size wise. That one is a lot longer than I imagine you’d be able to find in any furniture store. Love this table! 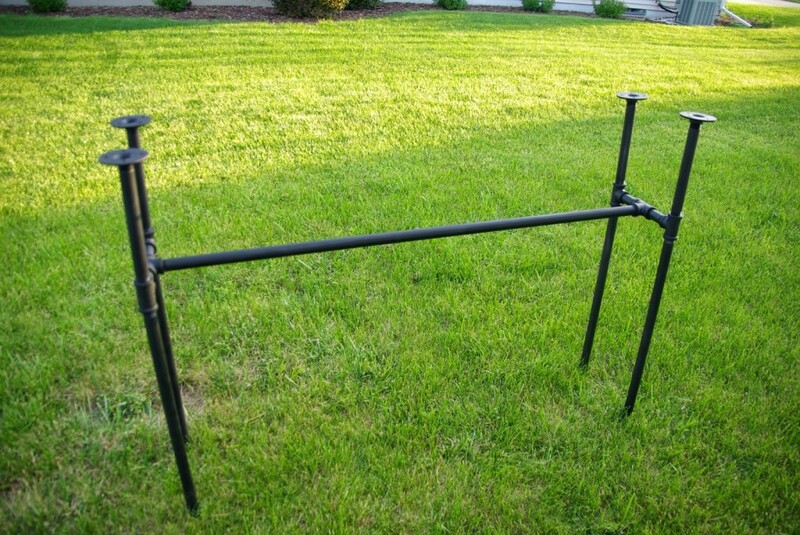 Wondering if you could reverse the legs and use the middle pipe/brace piece to place a second lower shelf.